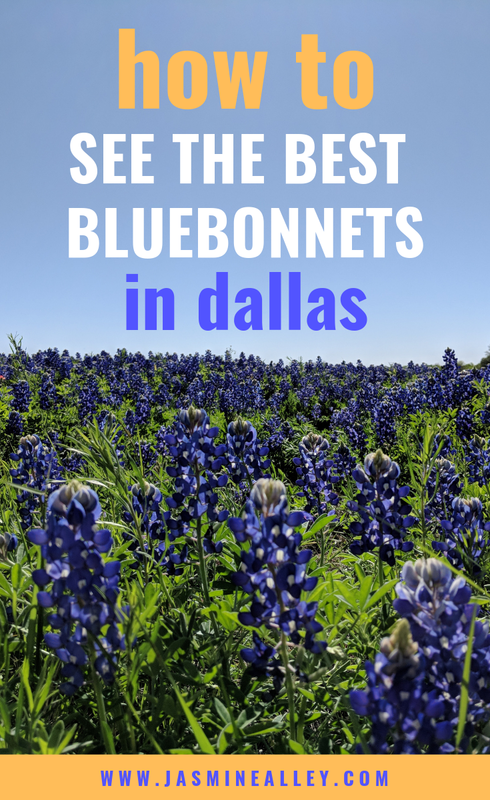 Anyone seeking wildflowers in Dallas: the height of bluebonnet season is in April. 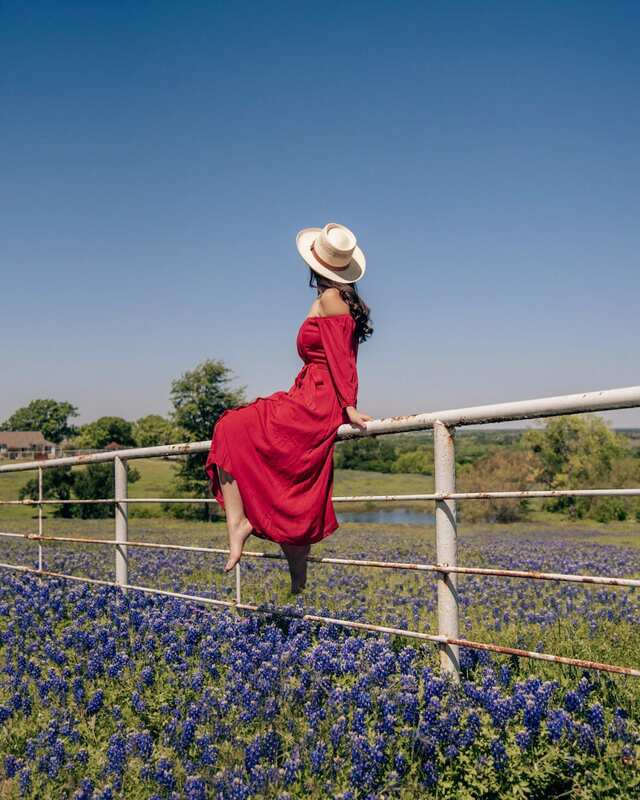 Seeing as bluebonnets are the state flower, if you’re in Texas, it just wouldn’t be right if you went all spring without spending some time among the bluebonnets!! 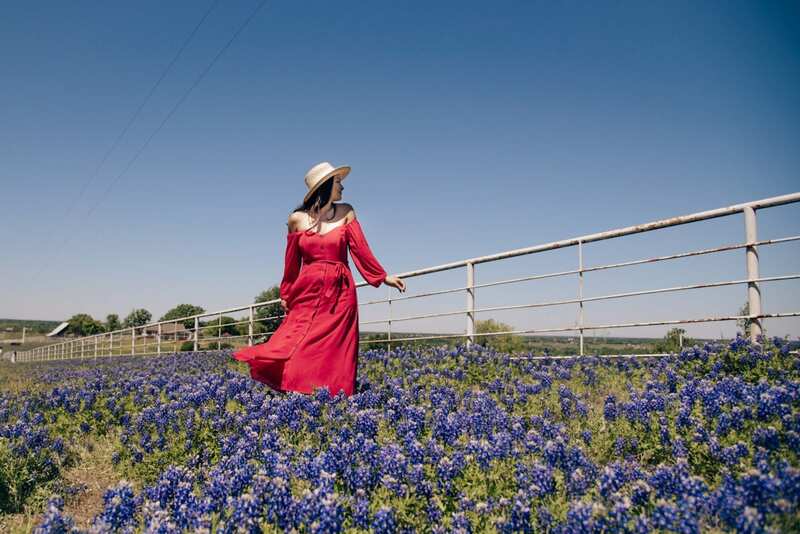 And the ultimate place to see bluebonnets is Ennis, TX. Fun fact: Ennis is actually the Official Bluebonnet City of Texas. Rightfully so, I should say. 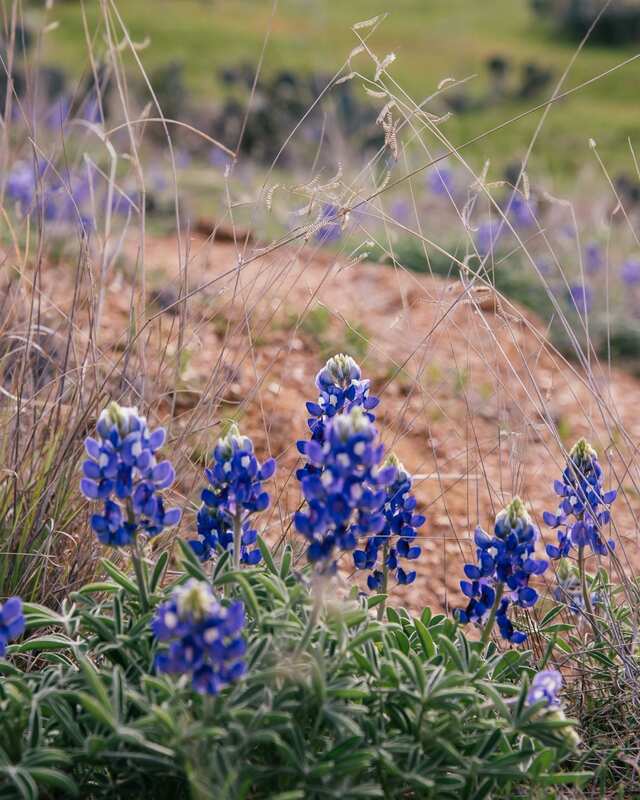 It houses the famous Ennis Bluebonnet Trail: a “trail” of great places to see the bluebonnets in all of their glory. 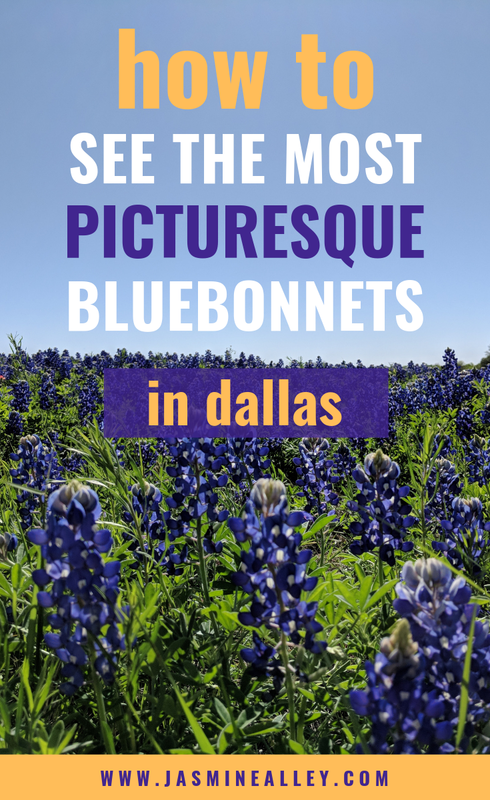 Basically, the Ennis Bluebonnet Trail is a compilation of locations for bluebonnet viewing in Ennis, which can be viewed on their app. You simply download their app, Ennis Y’all, (which works for both ios and Android) and check their map for bluebonnet locations. Each pin on the map expands into a brief description of what you’ll find there. And the great thing about the app is it also includes other things to do in Ennis if you want to make a day of it! When we visited, we passed a horse pasture where the owner had left a giant bag of oats so that visitors could feed their horses. We also saw some beautiful nature, like rolling hills and swans swimming on a peaceful little lake. The trails aren’t a walking trail- they’re a driving trail. The locations on the app vary in how far away they are from each other, but some are up to an hour away! Be careful when walking through the fields- there are some sticks that can get you! If you’re going in peak season, there will be a lot of people there taking photos. The good thing is that the fields are so big that it’s easy to find a spot where no one else is in your pictures! The best way to check the status of the blooms is to visit the official site here! 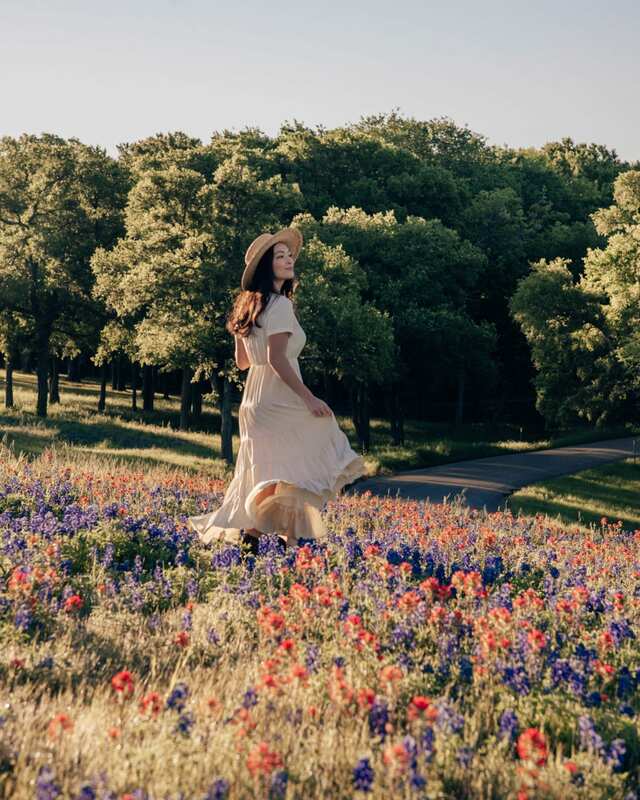 The Ennis Bluebonnet Trail is just forty minutes south of Dallas, and just waiting for you to go and take some photos in it’s gorgeous fields! 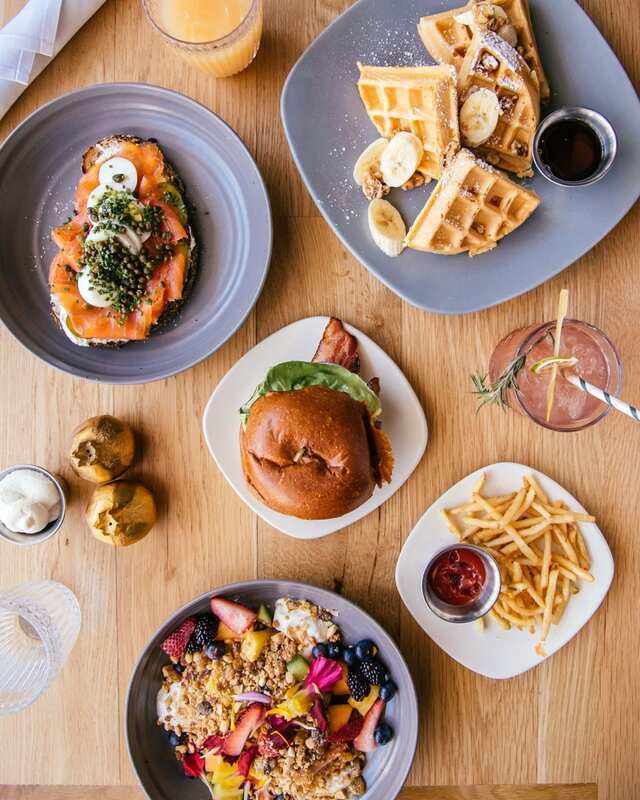 And if you’re just looking for Instagrammable places in Dallas? 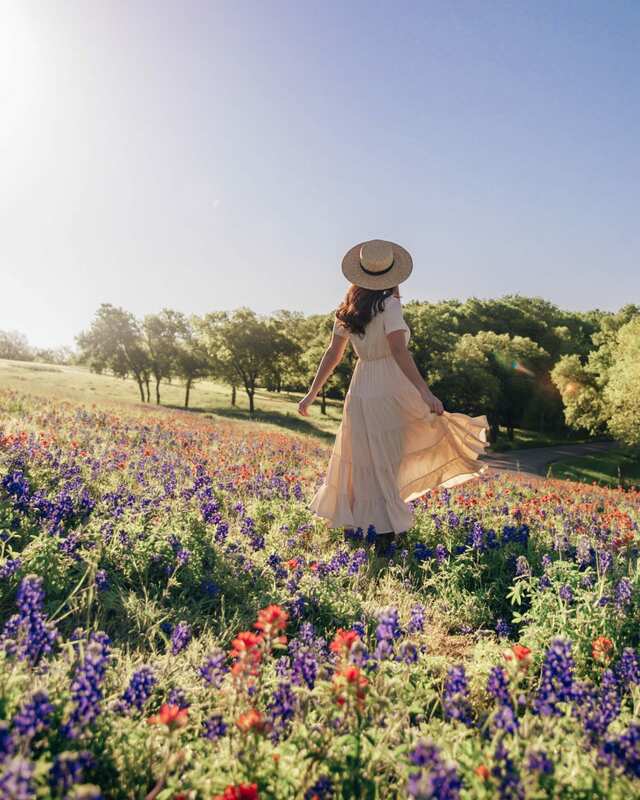 Check out this post on the 40 Most Instagrammable Places in and around Dallas! P.S. If you found this post helpful, please share it to Pinterest! You can use the image below for easy pinning!! Scottsdale, Arizona is one of the prettiest cities in America. Bold statement, sure, but I think it rings true! The gorgeous Arizona desert surrounded by mountains makes for a stunning backdrop to this palm tree-speckled town. 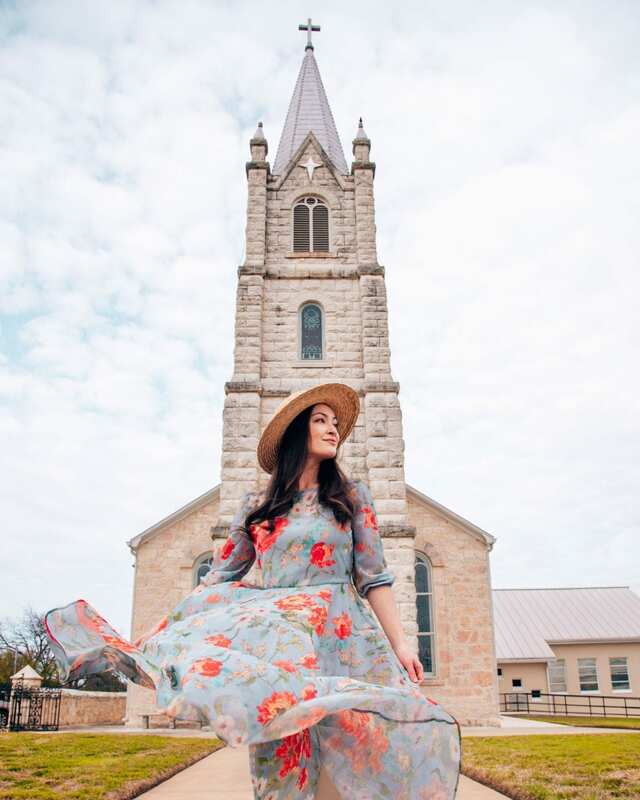 There are so many Instagram and photo shoot worthy spots in and around town. My husband, Harrison, and I visited Scottsdale after being invited by the Scott Resort to stay at their gorgeous hotel. I had been dying to see Scottsdale anyway, so it was a perfect situation! 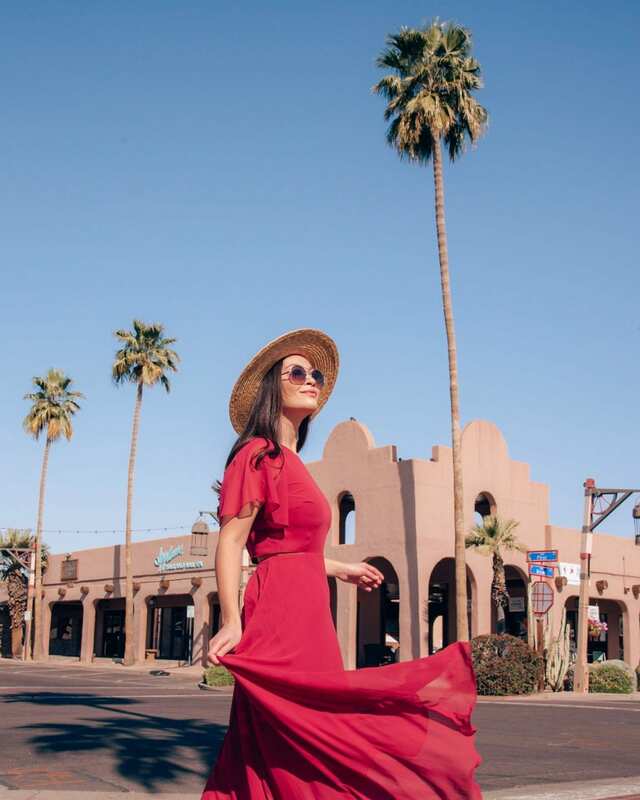 We booked our flights, I asked my Arizona-native friends for location recommendations, I researched on Pinterest, and came up with our itinerary. We were only in town for the weekend, but I feel like we were able to see plenty of it with my jam-packed itinerary, which I’ll share soon! 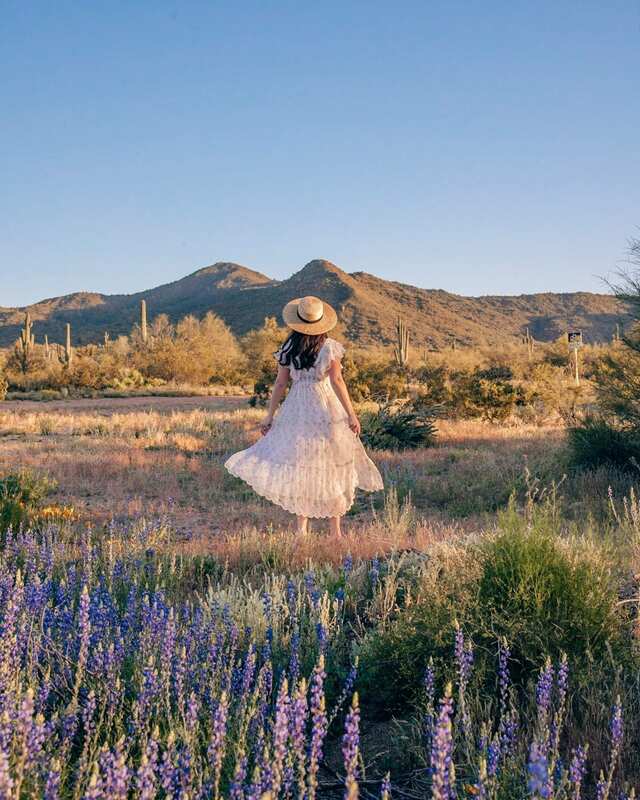 Without further ado, here are 12 of the prettiest places in Scottsdale. 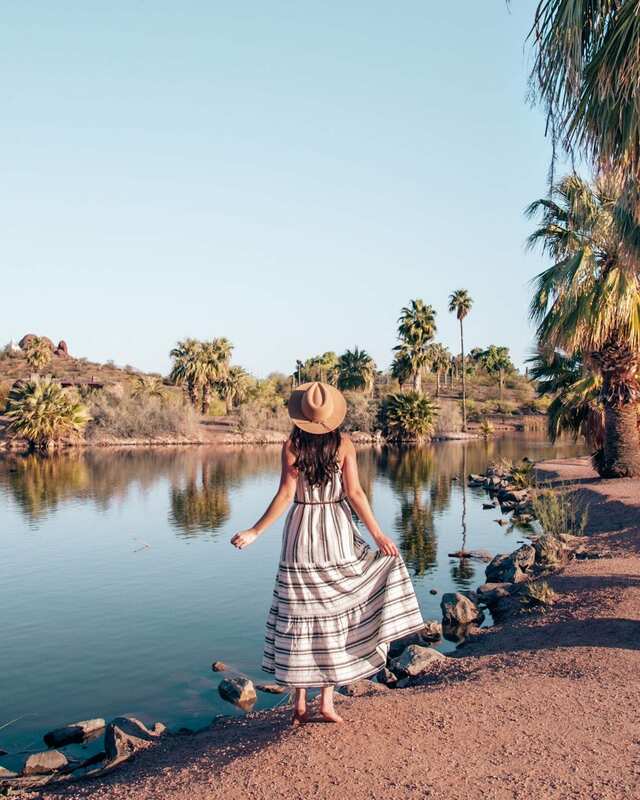 If you’re visiting Scottsdale, arguably the best place to stay is The Scott Resort. With its two large resort pools, beautiful interiors, and amenities, it’s a no brainer. The interior is mid-century modern meets jungle, you can rent a relaxing cabana by the pool, and it has amenities like bike rentals or the free shuttle (just runs off of tips) that will take you anywhere within a few miles. Sure, we were invited by The Scott, but I’d 100% recommend it and book again out of pocket. It’s an absolutely beautiful resort (no joke, even the bathrooms are beautiful) with great customer service. We absolutely loved our stay and it was so easy to photograph this resort! Papago Park is close to both the Zoo and the airport- we actually made it our last stop before heading to our flight. It features a community fishing pond, multiple lakes, and great mountain views. But what it is most famous for is the Hole in the Rock, which is a hike up to a hole in a rock (clever name, huh?) that offers views over the entire city. 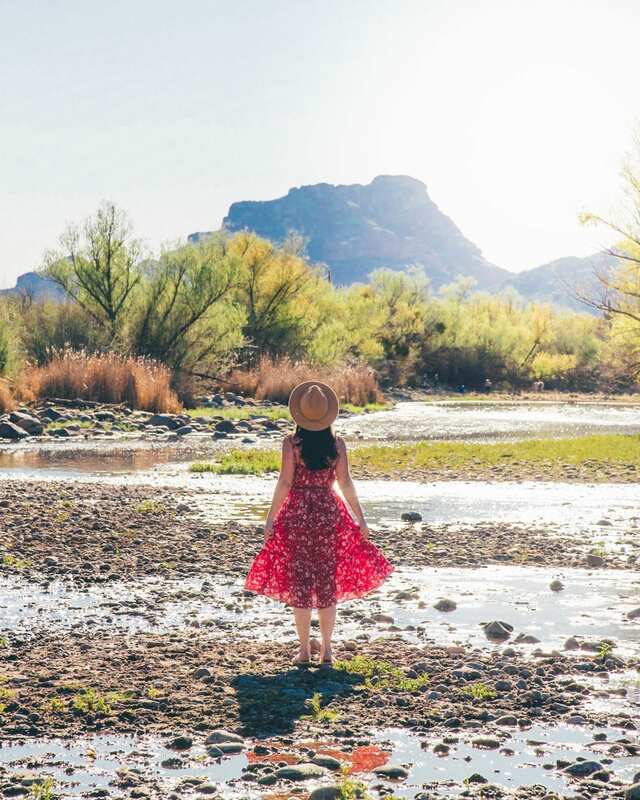 If you’re lucky, you’ll see the wild horses that graze along the Salt River in this area! This area does require a Recreational Pass (which we didn’t know ahead of time and parked anyway- so park at your own risk!). We visited during an off season when there isn’t tubing in the area, but if you visit over the summer, you can actually float the river! The Salt River entrance by the Phon D Sutton Recreational Area is a really neat area to visit if you want to do a little bit of swimming! We saw a few families swimming in the river off of the shore here, and I waded in to cool off a bit. 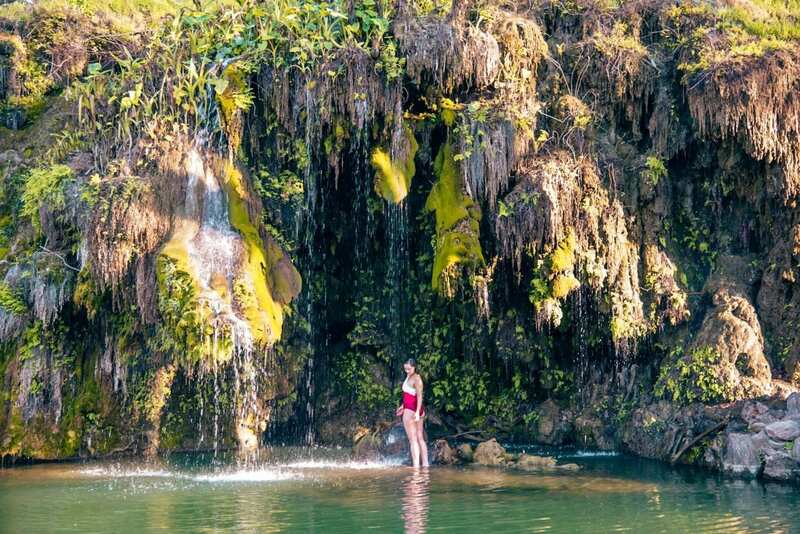 Other than swimming, you’ll find some stunning water holes, a beachy shore, some interesting light gray rock formations, and a view of the mountains in the distance. Go at golden hour and you’ll be rewarded with gorgeous sunlight streaming through the trees over the mountain. We captured the right hand photo on the side of the road after exiting the main road from Phon D Sutton. There are great blue wildflowers (possibly bluebonnets?) that grow on the side of the road as you’re turning right to exit. Lost Dutchman State Park is nestled in the Superstition Mountains. Be prepared for tall saguaro cacti, wildflowers in the spring, and great views of the Superstitions. Note that the trails are pretty rough– my friend who has twin babies had difficulty pushing their stroller around at this park, so keep that in mind! There are multiple parking lots throughout this park and multiple trails to explore. It costs $8 per vehicle for a day pass (and they accept credit cards). This mural is right in the heart of a very fun part of the city: the Fashion Square. In the Fashion Square you’ll find great shopping and dining options. There’s an iconic old ice cream shop, Sugar Bowl, right by The Fashion Square as well, which is pictured on the right. 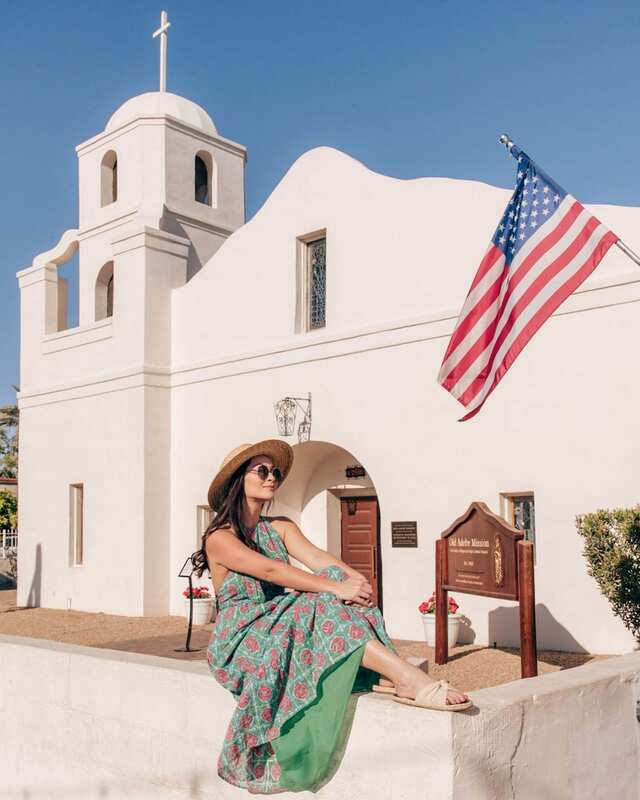 I actually had seen it on other people’s posts for picture spots in Scottsdale, but when we walked in it didn’t seem very appealing (we were seated at a sticky, not photo-worthy booth and the store smelled like a dirty mop). But if you visit on a week day when it’s not as crowded, I can imagine that you could get a cool shot if you’re seated in a pink booth! 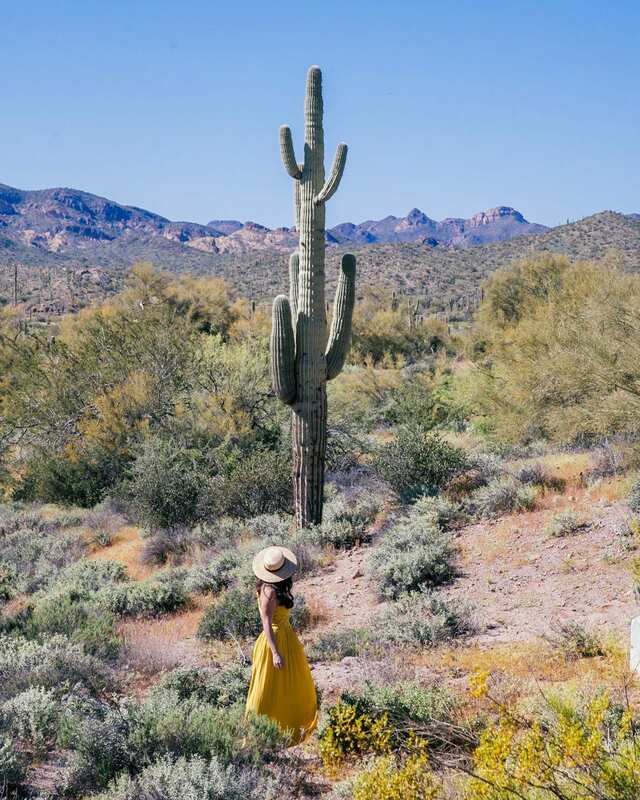 We headed to Usery Mountain Regional Park and on the way I saw these two gorgeous spots off the side of the road. When we got to the park, we decided we’d rather photograph the surrounding area than pay for access to the park for just a few photos. So we turned back around and stopped off along the road for these shots! It’s really true when they say it’s not about the destination but the journey along the way! Here are two great views that are diagonal from each other! We got to The Mission at 8 in the morning on Sunday, but it was covered in tents for an art show! So instead, we took the picture on the right hand side since the streets were completely empty. We came back to The Mission after the art show ended to then get the shot on the left! The Canal Club is located within The Scott and not only boasts a gorgeous setting, but delicious and incredibly photogenic food as well! I ordered lox toast and Harrison opted for the fruit granola and brunch burger, and we got waffles to share. Anywhere you go in The Canal Club is photo-worthy. 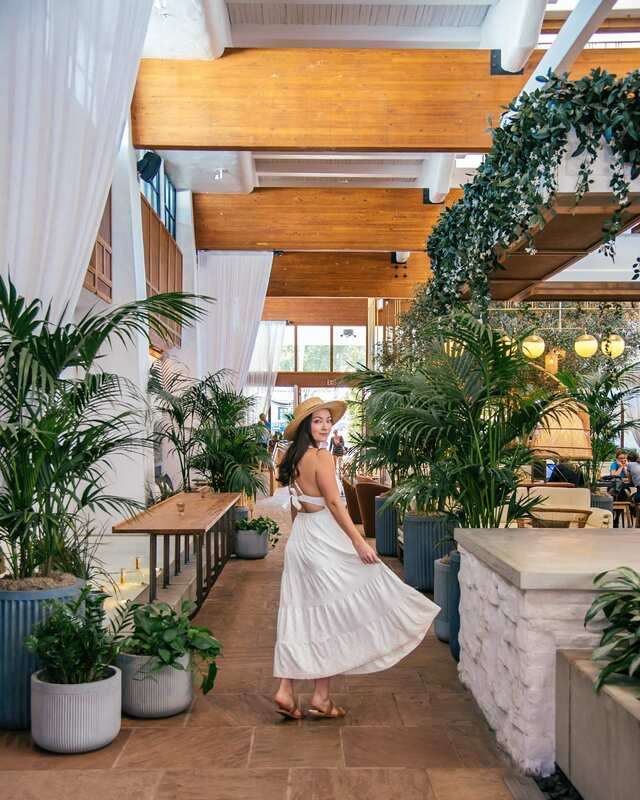 For example, they’ve got a large booth in front of a gorgeous green palm print (you can see it in the back of the photo with me in it), as well as patio seating that is decked out with plants. This location is great for a sunrise or sunset shoot! 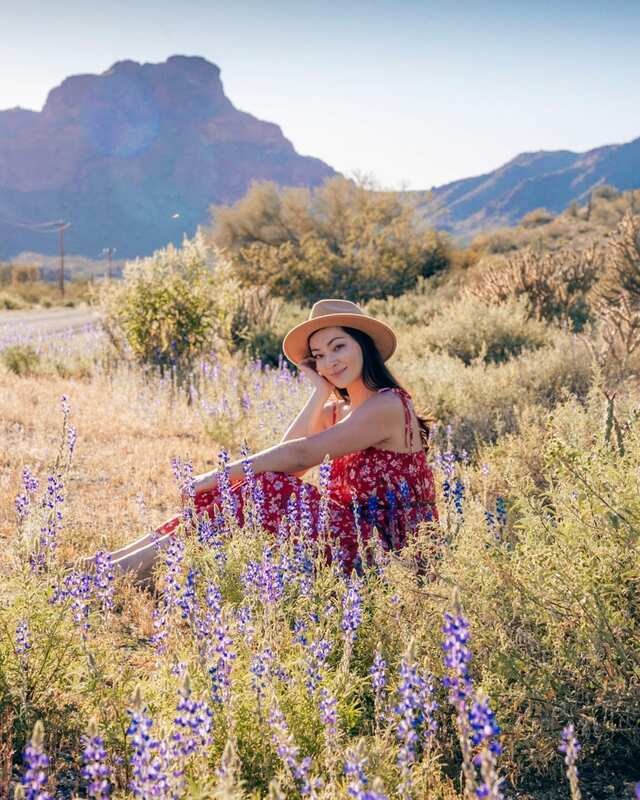 When the wildflowers are in bloom, you can get a dreamy shot with them in the foreground. How to get here: navigate to the intersection of Hayden and Legacy. As you’re driving north on Hayden, there will be a left hand turn onto Legacy. Instead, pull into the little parking lot on the right. Park and explore for great photo locations! 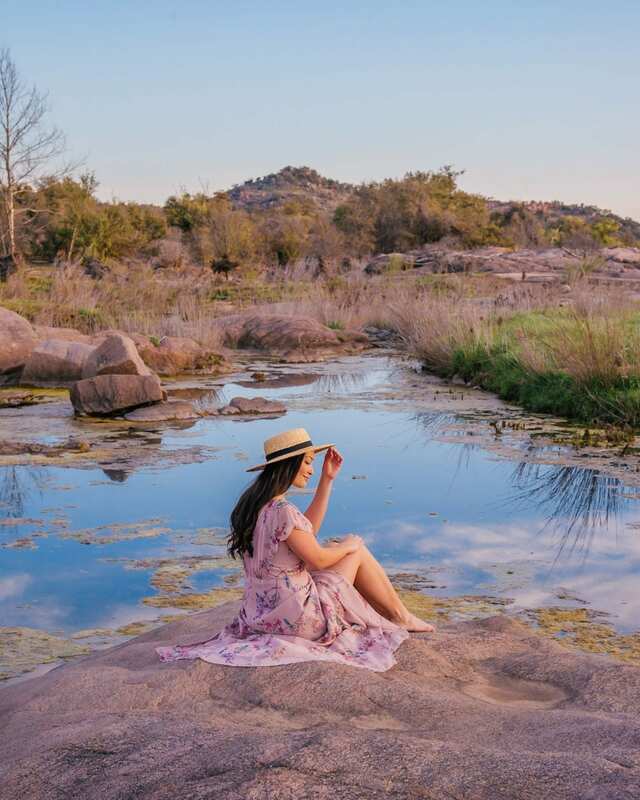 Also, nearby you’ll find a scenic preserve, the McDowell Sonoran Preserve, so you can check out both spots while you’re in the area. You’ll find Diego Pops in The Fashion Square but I’m giving it its own spot on this list because of just how cute it is! 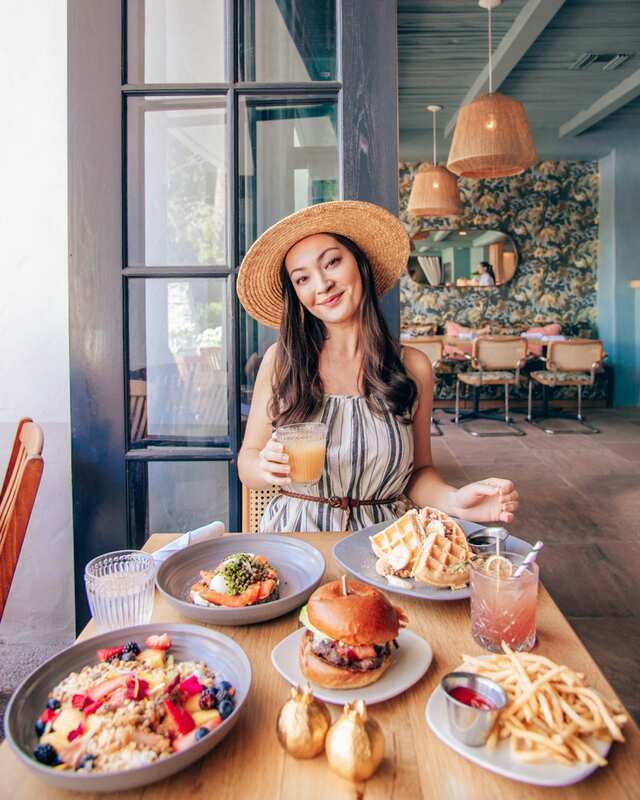 You can get your drink in a coconut, there are great neon signs on the walls, and Instagram-worthy wallpaper in certain sections of the restaurant. Also, their food is wonderful. Nuff said. 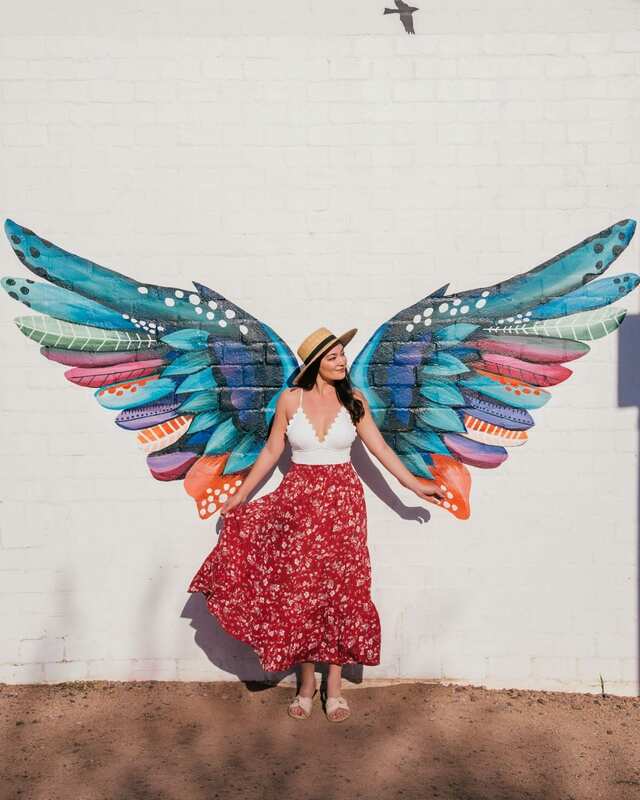 These murals are technically in Phoenix, but are just a short drive away, so I figured I’d include them! The best part of where these murals are is that this area is literally full of murals, everywhere you turn. So if you’re in the market for a mural photo and want your choice of mural, this spot is for you. We found these murals by navigating to monOrchid. But this list is in no way exhaustive! 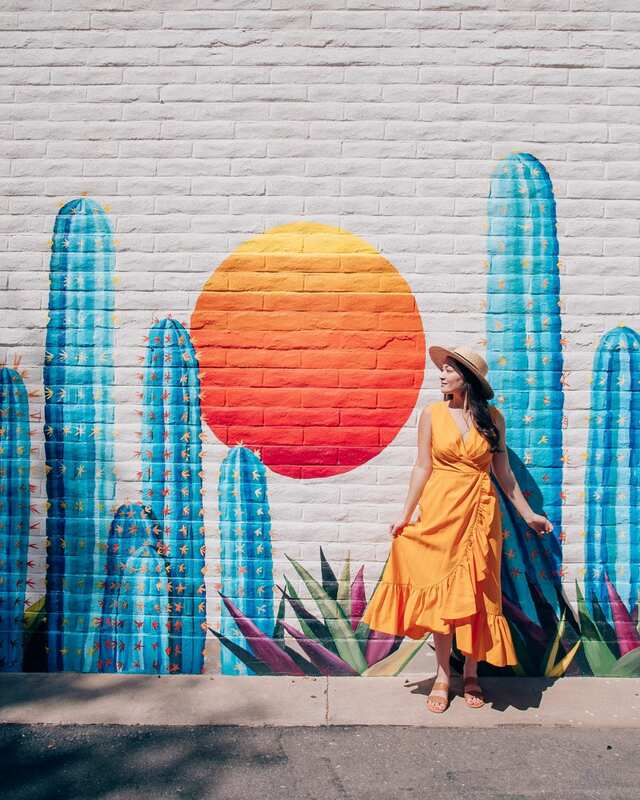 There’s the Desert Botanical Garden, the Mesa Mural, and so many more places to be photographed! 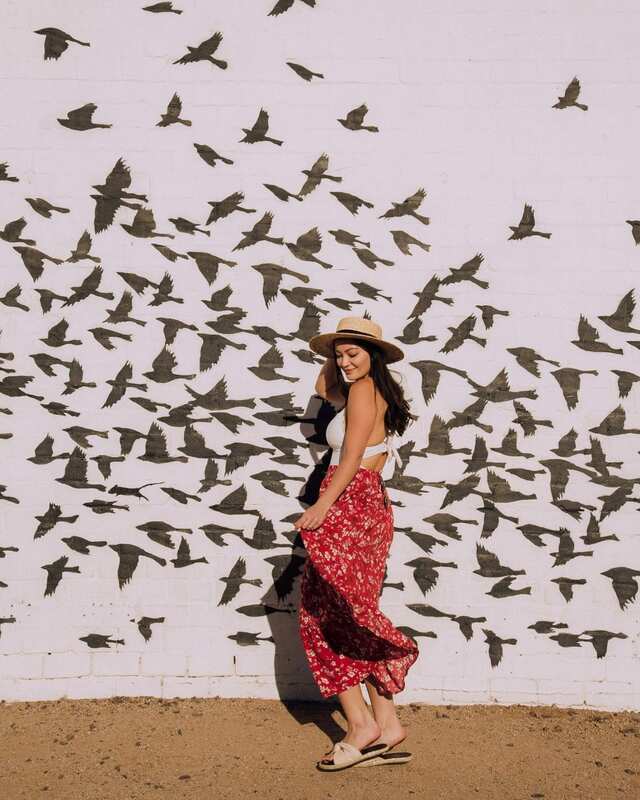 Comment your favorite photo spots below, and I’ll check them out next time I’m in Scottsdale! Looking for a local adventure on the water? 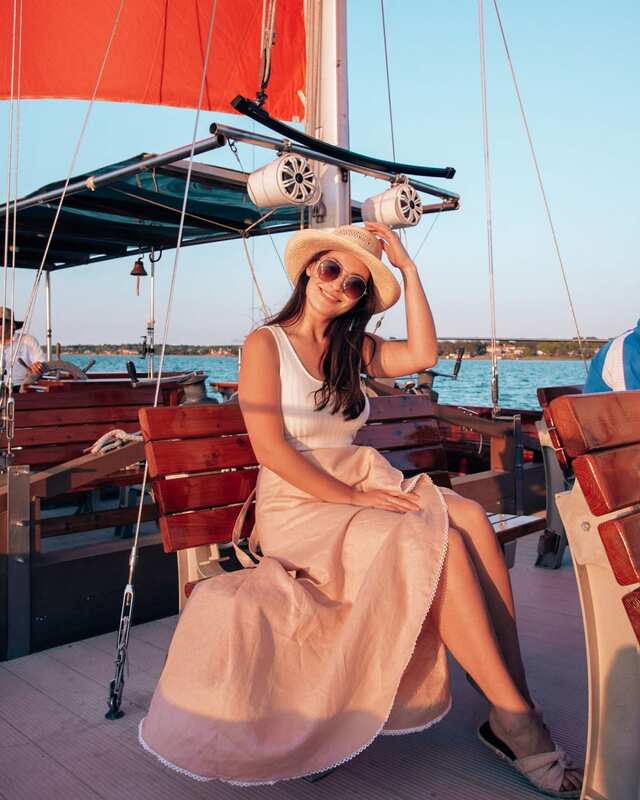 Sail With Scott is an hour-and-a-half cruise around Lake Ray Hubbard, located about 35 minutes from Downtown Dallas. 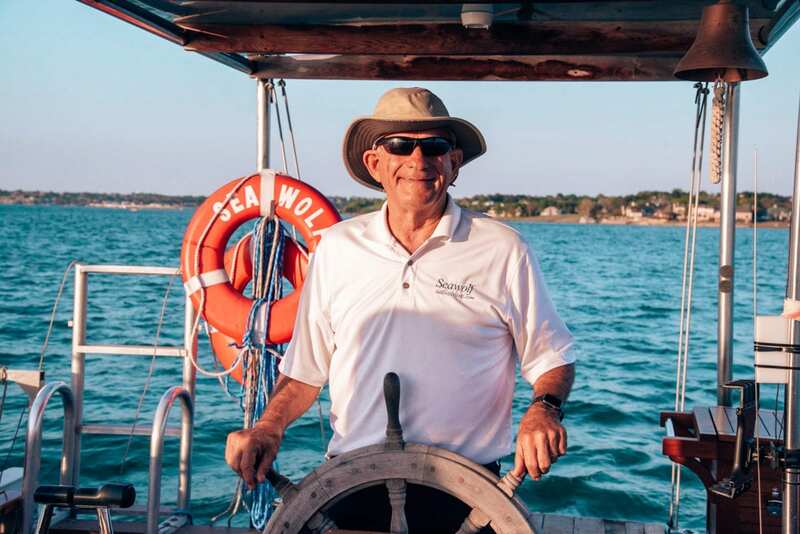 The former mayor of Rockwall, Scott Self, captains the sunset cruise on Seawolf, a 40-foot catamaran he built himself. 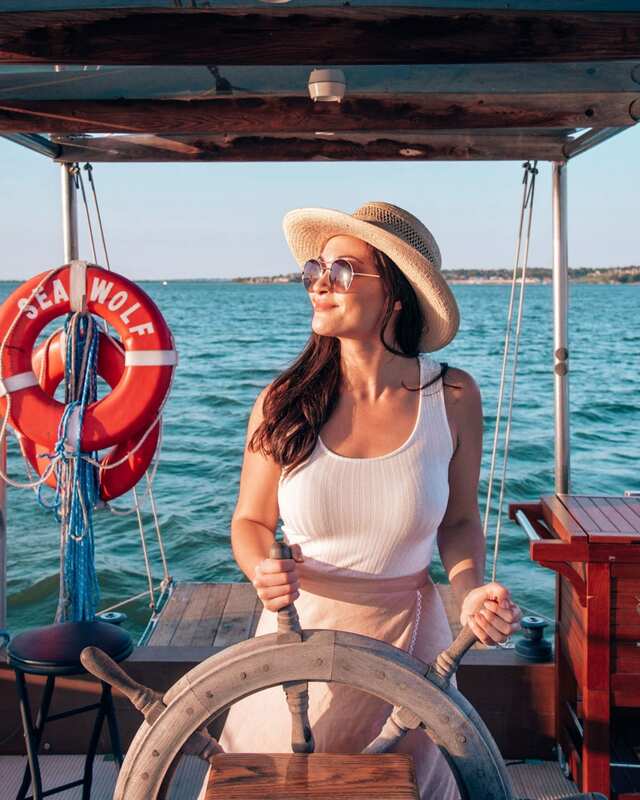 Cruising around on Seawolf, you get all of the relaxation that the weekend demands. Bring a picnic basket or cooler filled with goodies, because it’s a treat yourself kind of trip. And when the sun touches the water, get ready for Captain Scott to blow his conch shell while everyone on deck takes a moment to thank God for what they have. 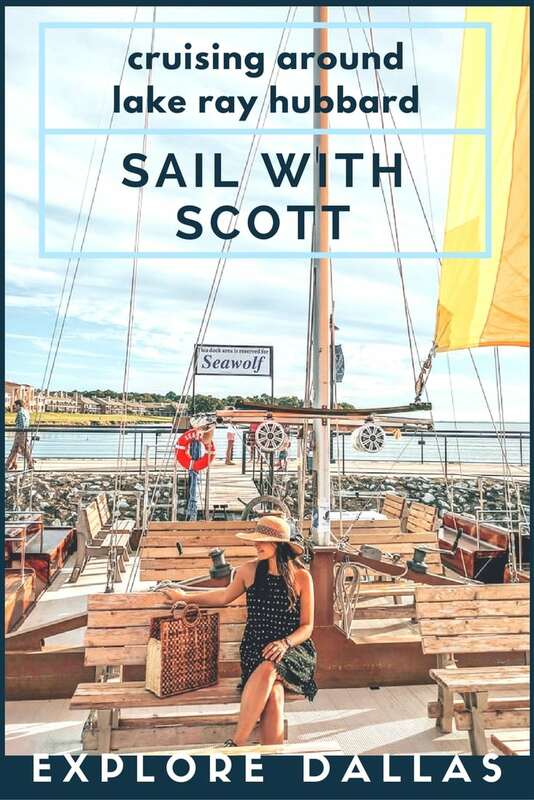 Keep on reading for full details on Sail With Scott! The boat itself has plenty of seating areas. If you would like to wear a life vest, Seawolf comes fully equipped with over 100 life vests. There are benches and a few tables, seating areas on the sides of the boat, and bean bag chairs if you’d prefer to sit right by the water. And yes, there are restrooms on board! Seawolf is a work of art and you can truly see the hard work that Scott put into it, when he was gluing board by board together. 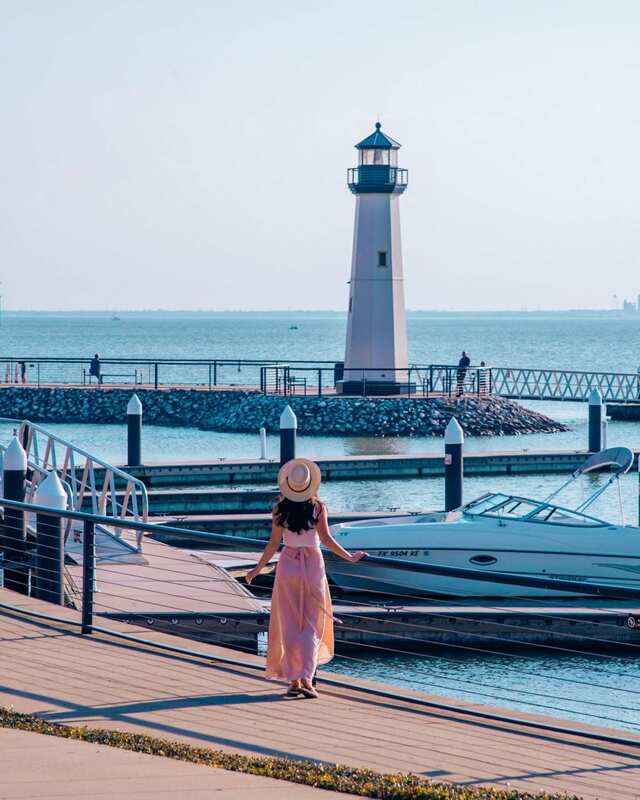 The boat leaves from Rockwall Harbor, right by the lighthouse. It’s best to arrive 30 minutes before the departure time. You’ll see a “Reserved for Seawolf” sign where the boat docks. When you make a reservation, it’s for a one and a half hour boat ride. This happened on one of our visits; we had just left the dock when Scott got a phone call, and we saw people waving from shore. Fortunately the boat was close enough, so Scott turned around because it’s Texas and we’re all friendly here! But don’t worry if you’re on the boat and this happens; he tacks on the extra time to make sure you get the full experience. Don’t forget to make a reservation online! If you just show up, there’s a chance that they’ll be fully booked. Also, there are no guarantees he’ll turn the boat around, so don’t be late! Scott will gladly let you take a turn at the wheel! Drinks– yes, you can bring alcohol! Scott provides water, but if you want any other type of drink, you can just bring it with you! Cooler/picnic basket– to store your food and drinks. Don’t forget utensils and napkins! Kids– kids are allowed! However, Scott’s team recommends bringing them on the family-friendly cruise, which is right before the sunset cruise. Dress for the weather and for the fact that you’re going to be on the water. This means two things- temperatures drop and there’s wind. So no flowy dresses, ladies! And bring a jacket, just in case. Don’t worry if you forget it, though, because the boat comes fully equipped with blankets if they’re needed! Also, be prepared to take heels off when boarding the boat for safety reasons. A lower heel is definitely more practical, especially if you stand up and there are waves rocking the boat. While up front, I got to learn a bit about Scott. After Scott finished college and started working at Merrill Lynch, he decided to make a list of life goals. One of them was being the mayor of a small town. When he was in his late 20’s, Scott moved from New York to Dallas. Once in Dallas, he realized he needed to find a small town to live in if he wanted to be mayor of it! Rockwall was the perfect place! But his love for Rockwall didn’t end when his term did. He has stayed heavily involved in the town to this day. Now operating his sunset cruises Seawolf around the lake is his favorite pastime! 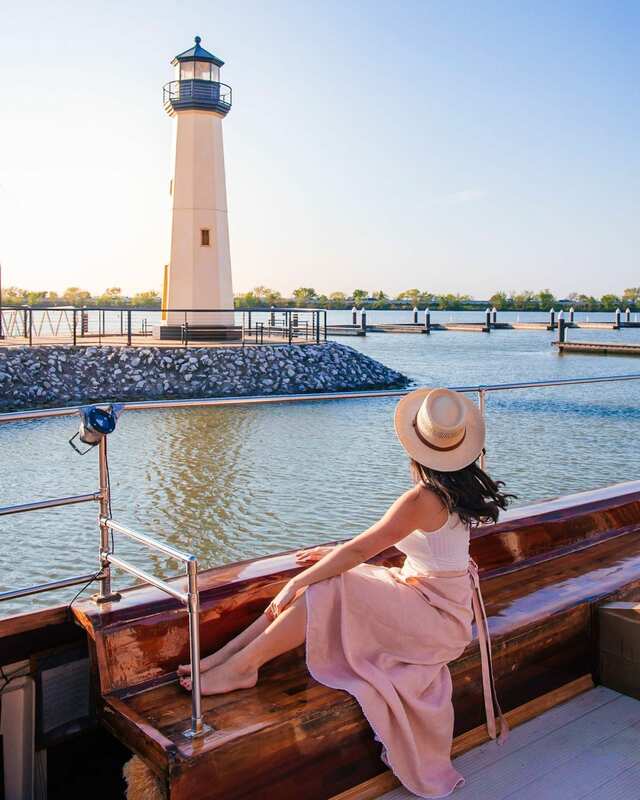 So how does a former mayor of Rockwall end up offering sunset cruises around the lake anyways? Sailing had been a passion ever since he was a kid, sailing on Eagle Mountain Lake in Fort Worth. Since then, Scott has sailed the Atlantic and the Pacific, from Bermuda to London, and pretty much everywhere in between. He knew that when he retired he wanted to be able to sail as often as possible. 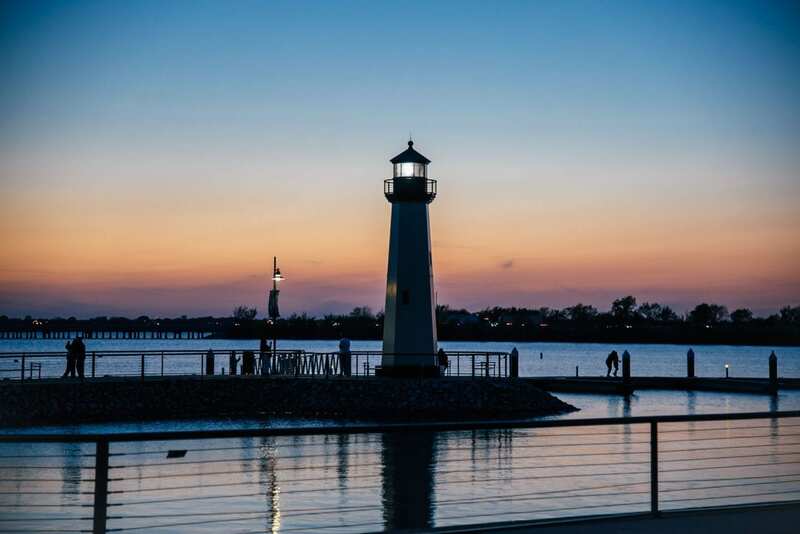 After his time as mayor, Scott actually worked as the City Commissioner, and had a big part in developing Rockwall Harbor. In a meeting where everyone brought their ideas for the harbor to the table, Scott suggested sunset cruises around the lake. “Okay, but who would operate them?” someone asked somewhat mockingly. Scott enthusiastically said “I would! !” and that was that! Sail With Scott was up and running a few years later! 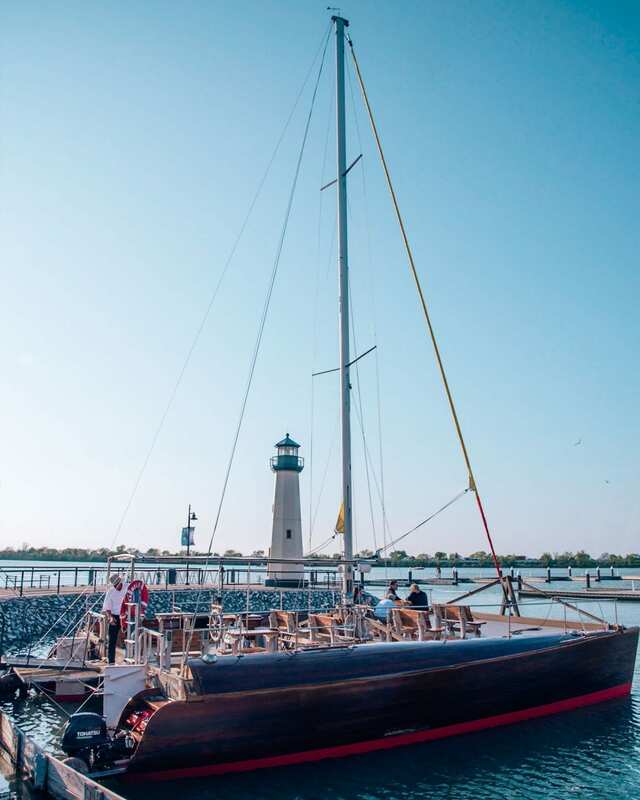 Sail With Scott allows him to sail, meet people, and spend time with his wife, all in the town he calls home. And when the weather gets too cold to host Sail With Scott, he’s off to the Caribbean doing private week-long boat tours. It’s so easy. Just select your date & time here! Comment any questions below! 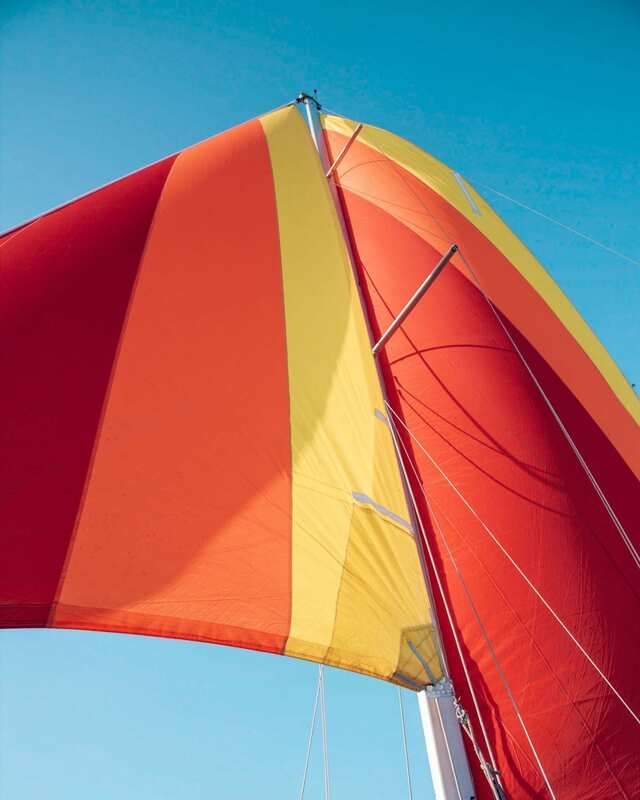 Happy sailing! If you found this post helpful, please share it to Pinterest! You can use the image below for easy pinning! 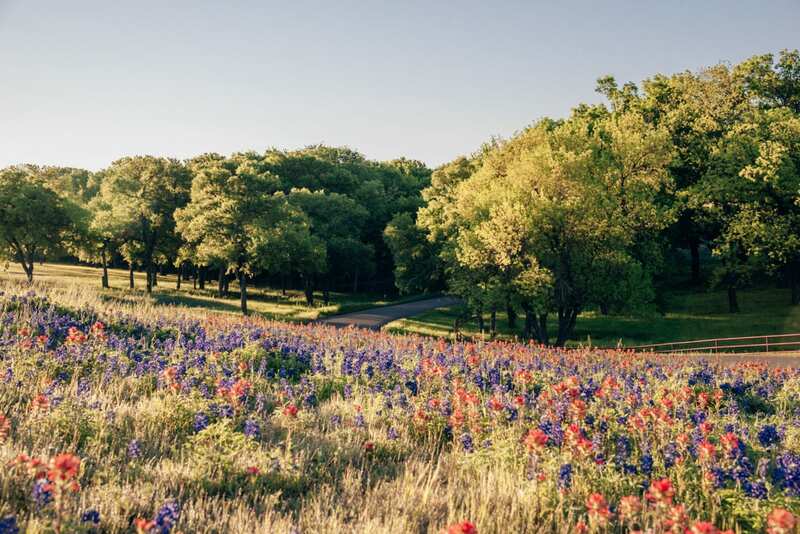 The Texas Hill Country is arguably one of the most beautiful parts of Texas. 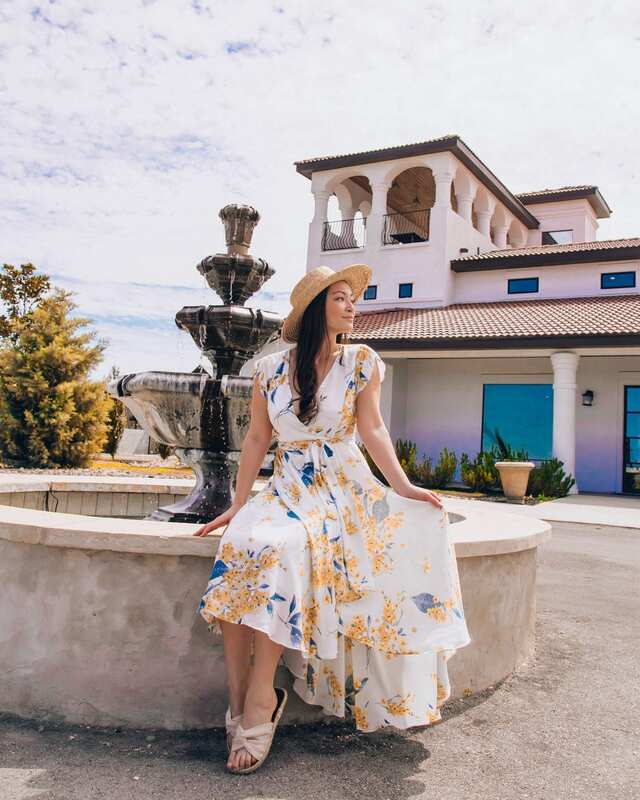 With rolling hills, wildflowers galore, vineyards, small towns, and dreamy natural pools, it truly has it all! 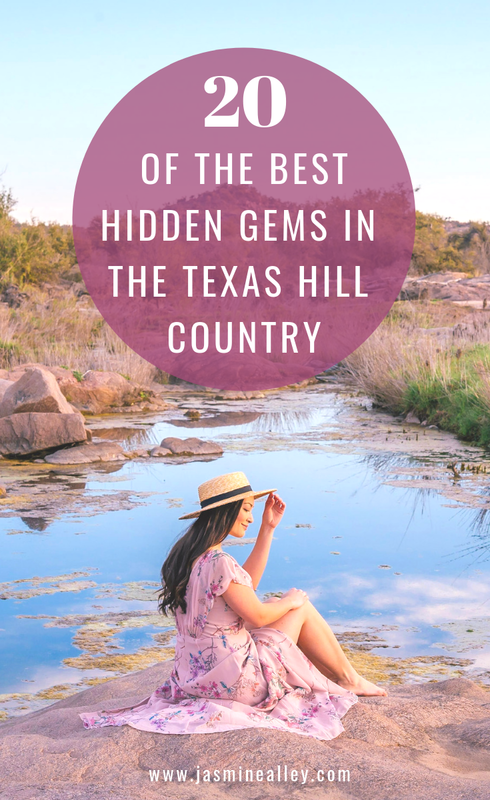 There are so many gems in the Texas Hill Country, and here I hope to share the best of the best with you! I’ve personally experienced all of these places, and they made my list of 20 because of their unique charm. 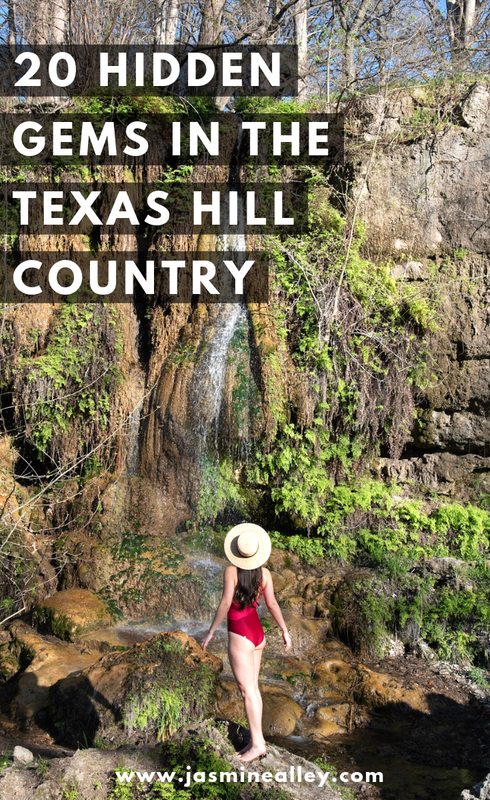 We traveled to the Hill Country partnering with Toyota as part of their Texas Adventure Week campaign. We hit the road in a gorgeous blue 2019 Toyota RAV4 and its lane assist and cruise control made driving so fun and easy! As my husband, Harrison, drove, I pretty much was always on the lookout for beautiful views and scenic overlooks. 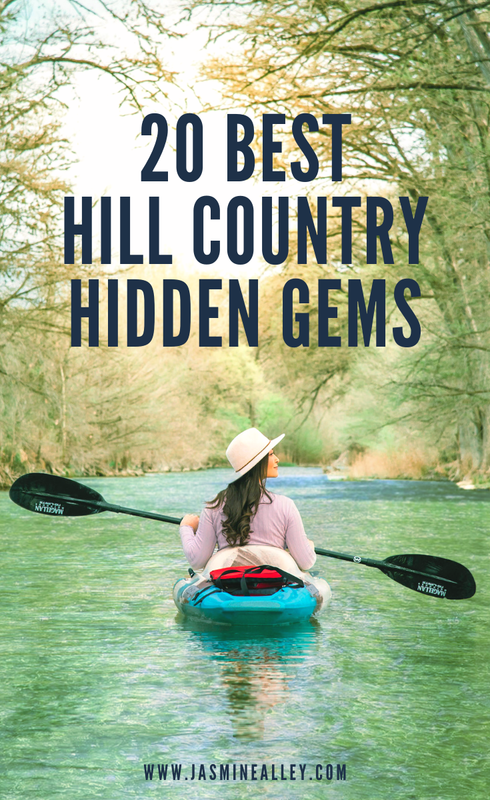 That combined with plenty of research beforehand brings us to this list of hidden gems! 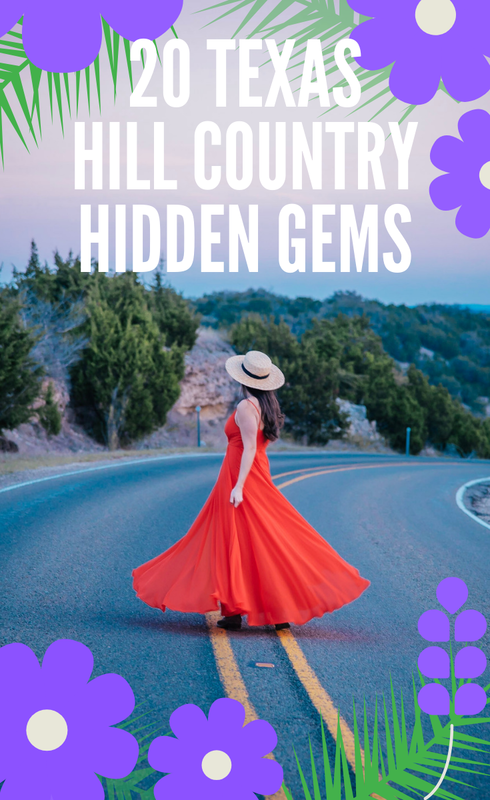 Without further ado, here are my top 20 Texas Hill Country hidden gems that you simply must experience for yourself! 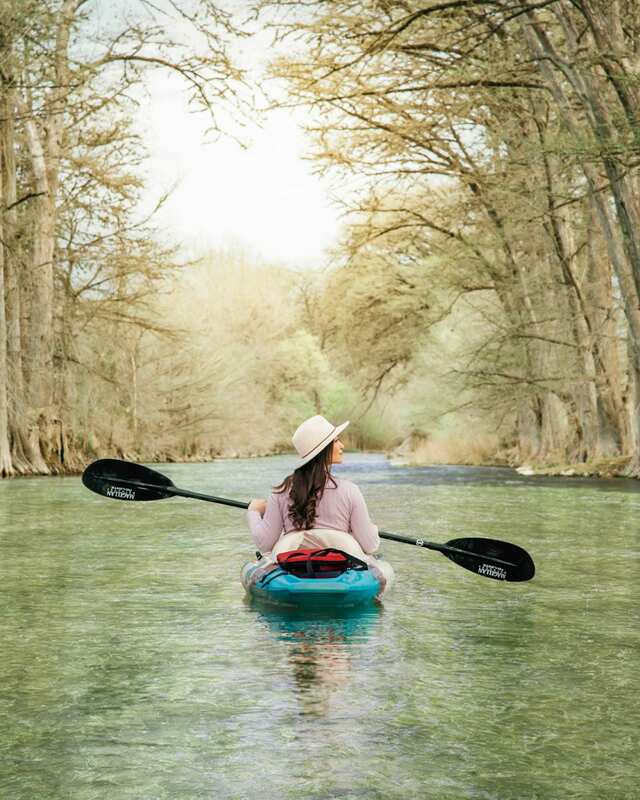 Kayaking the Medina River with The Medina River Company is a Hill Country must! They will provide you with kayaks and a shuttle to get to the beautiful river. As of March 2018 it costs $50 per single-person kayak, but you can check out their site for any updated information here! 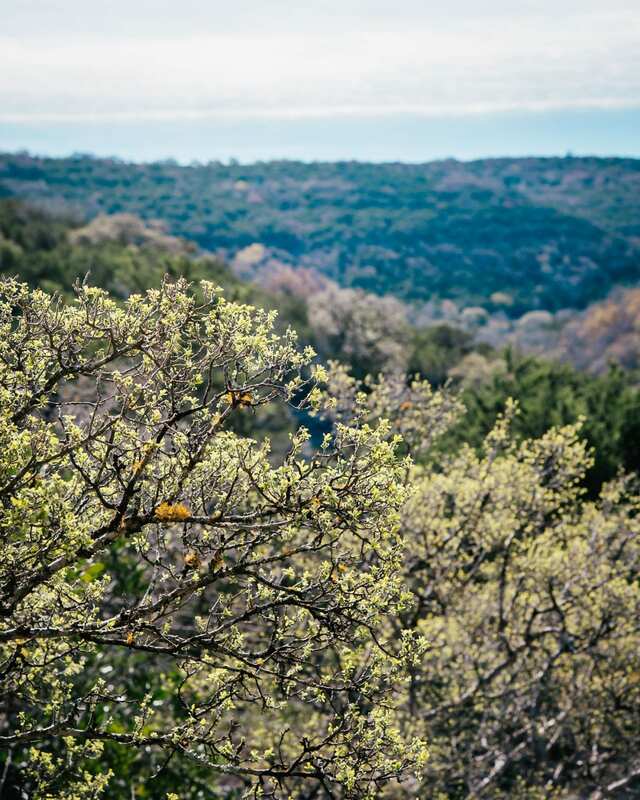 When the sun shines and the leaves are in full bloom, the Medina River is a sight to behold! The water is insanely clear- you can see all the way to the pebbled bottom. If you want to camp overnight on your own little island along the river, that is definitely an option as well! We got to meet Colby, the owner of the Medina River Company, who has owned it for the past 3 years. He showed us around and took us to this beautiful spot where the trees create a canopy overhead. The Medina River Company does such a great job of making sure you get the most out of your kayaking experience! They actually routinely kayak the entire river to make sure there are no fallen trees or hazards- so you know you’re in good hands! This park is most famous for it’s pretty falls and water formations pictured above. 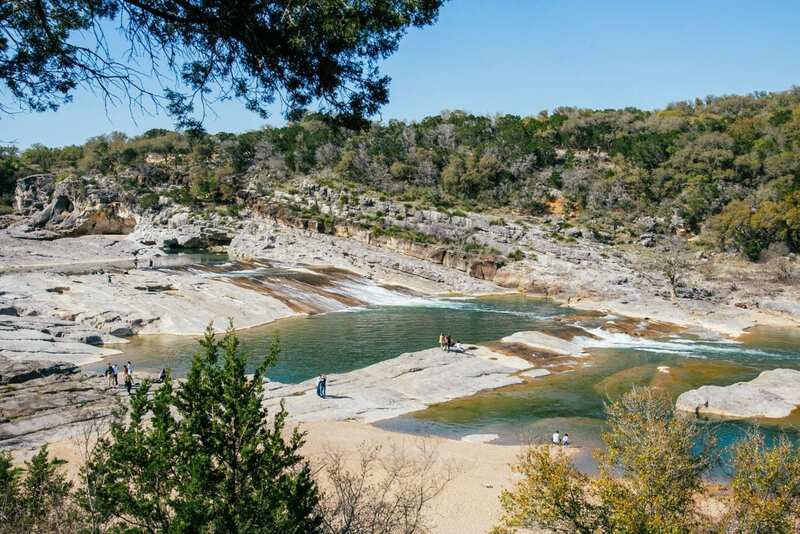 Pedernales Falls is a Texas State Park, which means you can book your visit ahead of time here! The view pictured above is an easy drive from the visitor’s center. It just requires a short hike (with stairs) from the parking lot. This park also has camping options if you’re looking for an overnight adventure! 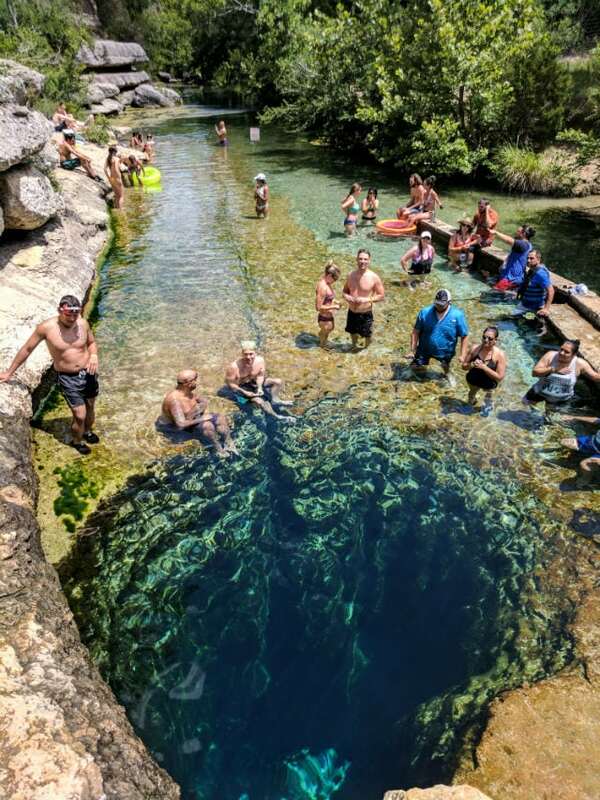 Jacob’s Well is located in Wimberley and is a stunning well that is over 120 feet deep. You can jump into the well from two different places depending on how brave you are! Reservations are definitely required– be sure to book in advance as this popular place can fill up fast! It also has an eerie history, read more about the allure of Jacob’s Well here! I include detailed visiting information in that post, so be sure to check it out if you’re planning on going! 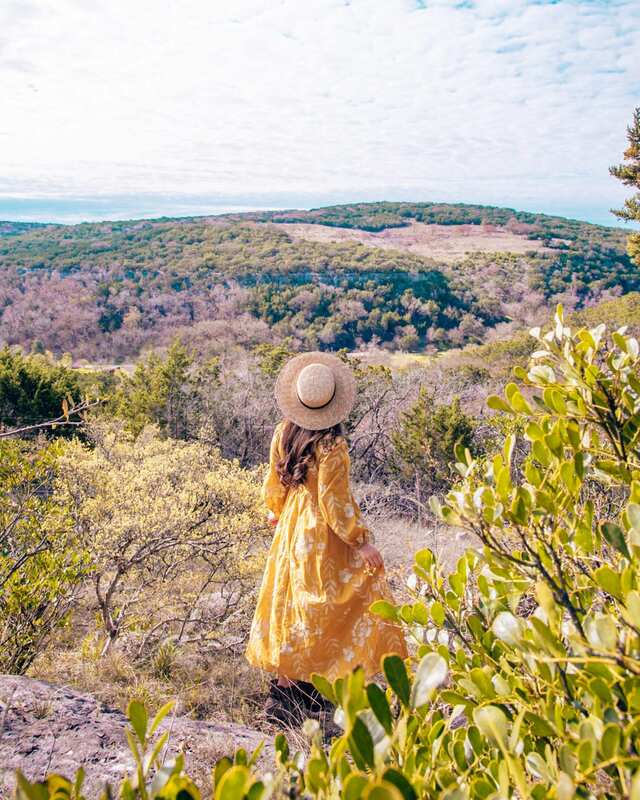 In my opinion, this is hands down the best nature experience in the Hill Country. There are two main natural springs here. When we visited on a Sunday in March, we had both springs entirely to ourselves! 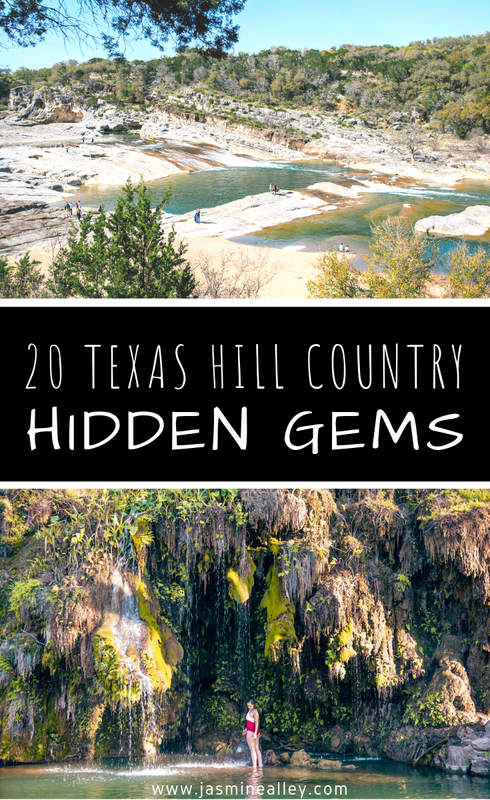 With moss covered rocks, a clear, clean pool, and dreamy dripping falls, you’ll see why this is my favorite Hill Country gem. Some things to note: this is not a Texas State Park. It’s actually privately owned and the entrance fee is cash only. It was $8 per person when we visited in March of 2019. My favorite part of this road is between Enchanted Rock and State Highway 16. 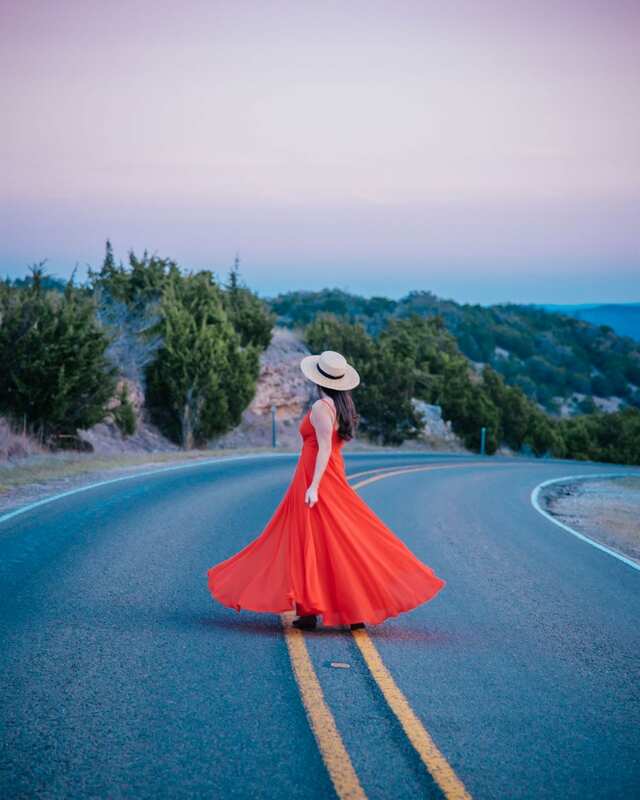 We actually stumbled upon this gorgeous road after being turned away from Enchanted Rock at sunrise since the park was already full and we didn’t have a reservation. But it worked out for the best as we got to then stop off along this road to capture some beautiful photos of the sunrise! A lot of places are fenced off private property, but you will still get wonderful views along this windy road! This road takes you towards Utopia, TX from the Medina River. Keep your eyes peeled for the stunning views that show up every so often! And if you’re in the area during wildflower season, this road is supposed to have fantastic blooms! This loop is becoming more and more famous for it’s brilliant wildflowers. We visited in mid-March before the blooms really came out, but got to see some pretty bluebonnets along the side of the road. If you’re staying in Fredericksburg, this loop is an easy drive from the town. With its increasing popularity, I’d recommend visiting on a weekday or really early on in the day if possible! Wildseed Farms is a neat store/farm where you can buy plants and see them growing, too. The main area of Wildseed Farms is stocked with a variety of plants for sale. But they are most known for their brilliant wildflowers that you can see from their walking paths. 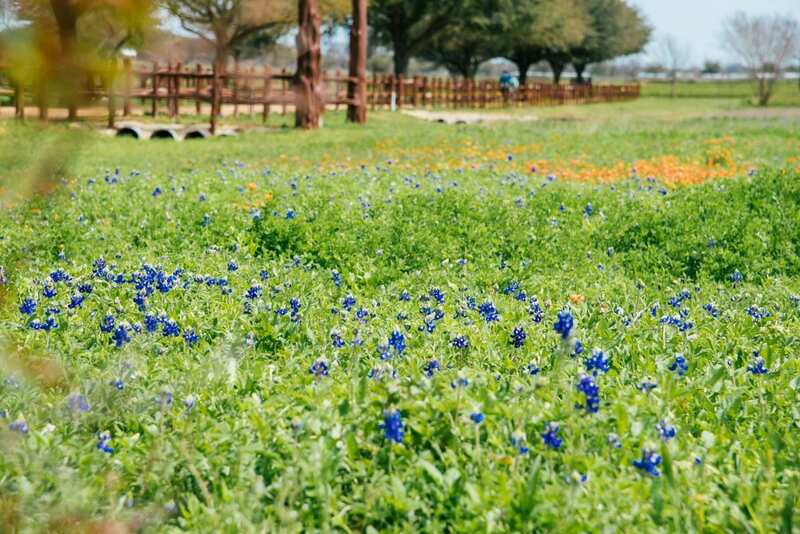 To make the most of your visit, head to Wildseed Farms during wildflower season when their poppies are in full bloom! 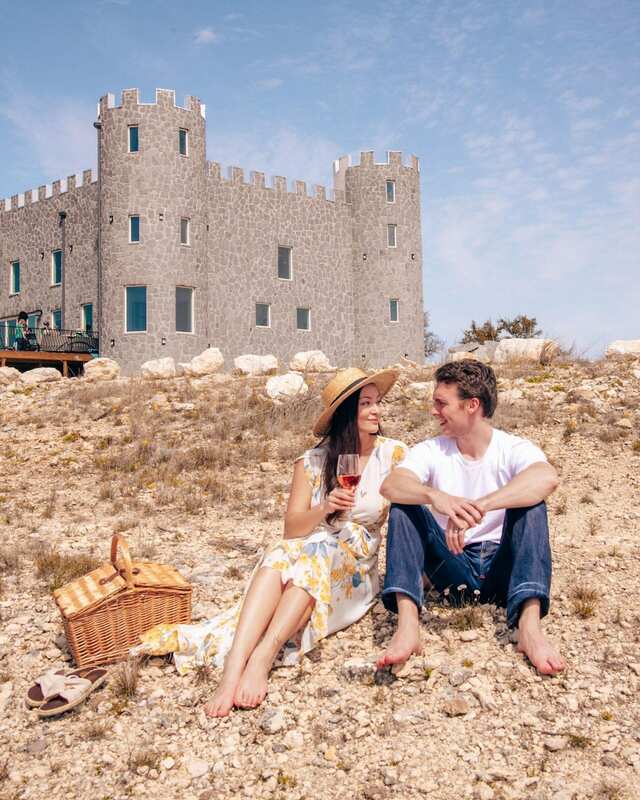 This newly constructed castle has a festive approach to wine country! We just happened to pass this castle along the side of the road, and of course I made Harrison stop right away so that I could see what was going on. 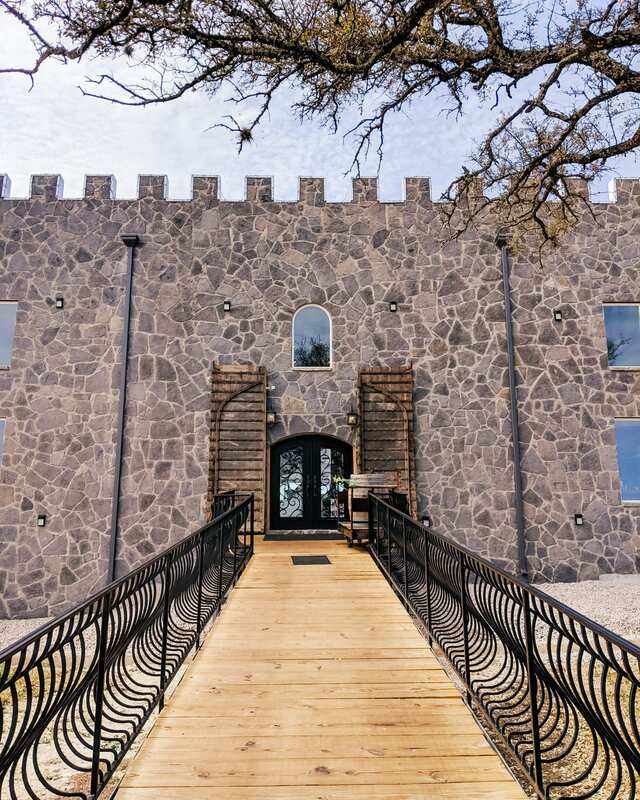 You walk over a small “moat” to enter the castle, and inside is a modern castle decked out in fun Renaissance flair. There was actually a guy dressed up in Medieval garb playing the bagpipes out on the patio! It’s a unique experience that you just have to see in real life! 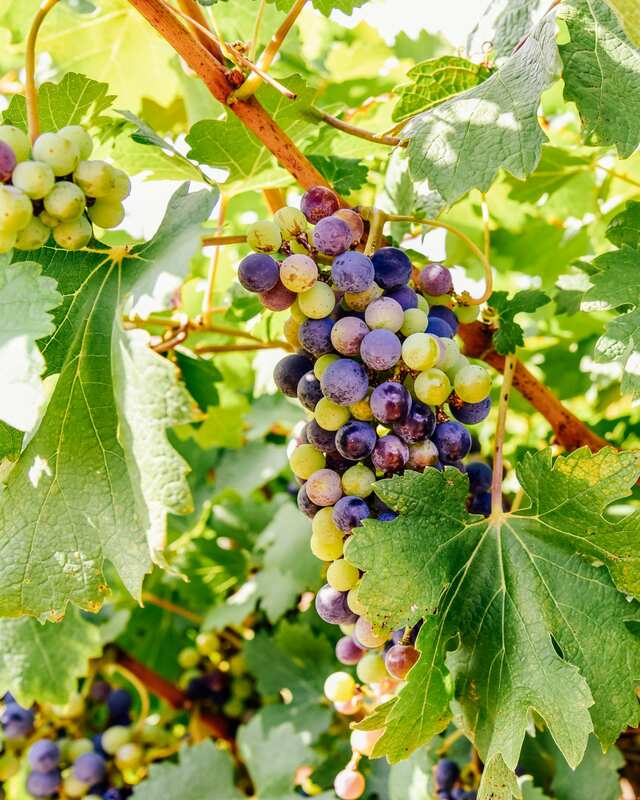 This Vineyard does wine tasting right. With the backdrop of live music and beautiful vineyards, our visit absolutely brightened my day (even more than it already was!). The grounds are as lovely as the wine is tasty! Barons Creek Vineyard has gorgeous architecture and great service. We visited it based on a recommendation from a friend and after seeing its incredible Google ratings. The atmosphere is fun and lively and the wine tasting is worth every penny! The Laurel Tree is hands down one of the top ten food experiences of my life. 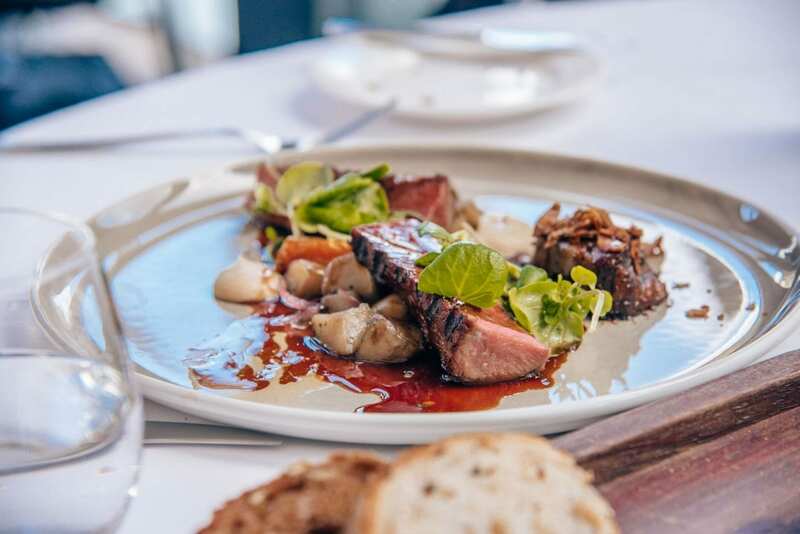 The Laurel Tree is only open on Saturdays and reservations are definitely required for this gem. But once you’re in, you have your table entirely to yourself for the entire lunch or dinner block. You’ll be served by kind, welcoming people who will time the meal to your specifications. 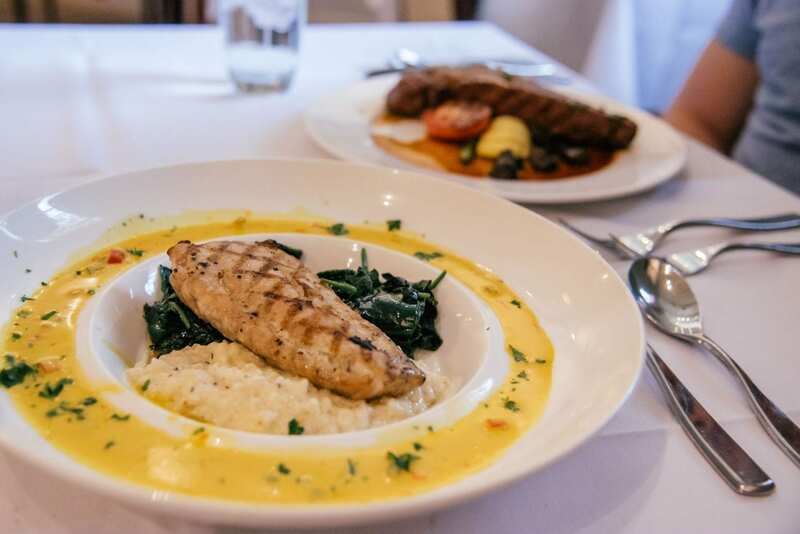 If you want to take a walk around the grounds between your appetizer and main course, you just let your server know and they will wait to bring out the next part of your meal. And the meal is actually a set meal based on what Laurel is cooking that Saturday. She chooses based on what’s in season, what’s growing in her garden, and what she feels like making! So the menu is different every single Saturday. Oh- and there is a treehouse in the backyard that you can reserve if you are hosting a special meal! 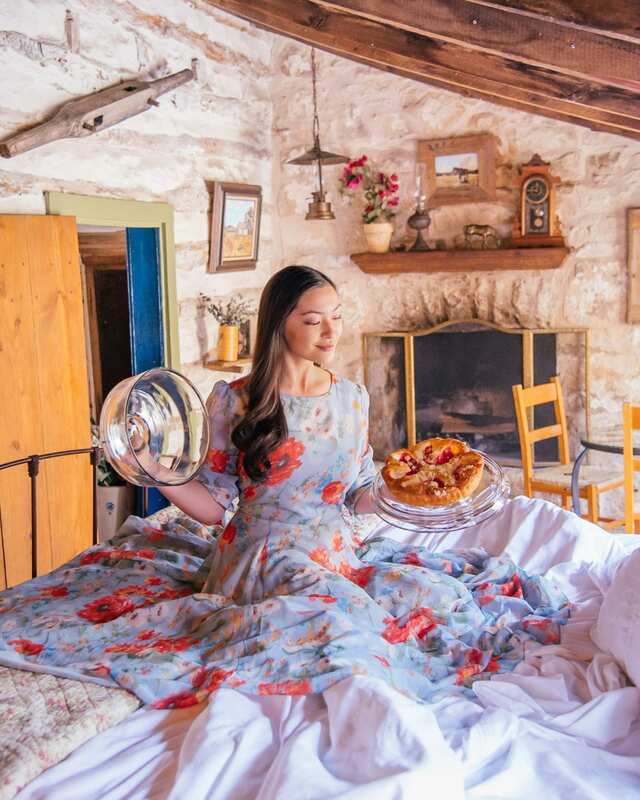 Stop into this adorable shop for a fresh baked apple turnover or an award winning apple pie! It’s right by the Medina River, so we stopped in after our kayaking and picked up some goodies. If you’re looking for a more substantial meal, their patio cafe serves burgers and more during lunch hours! 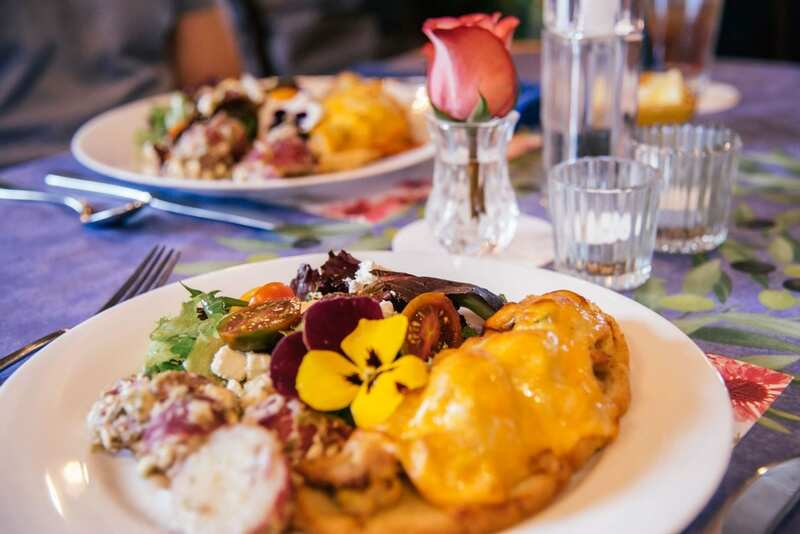 Enjoy high quality food in an art gallery-type setting at August E’s in Fredericksburg! 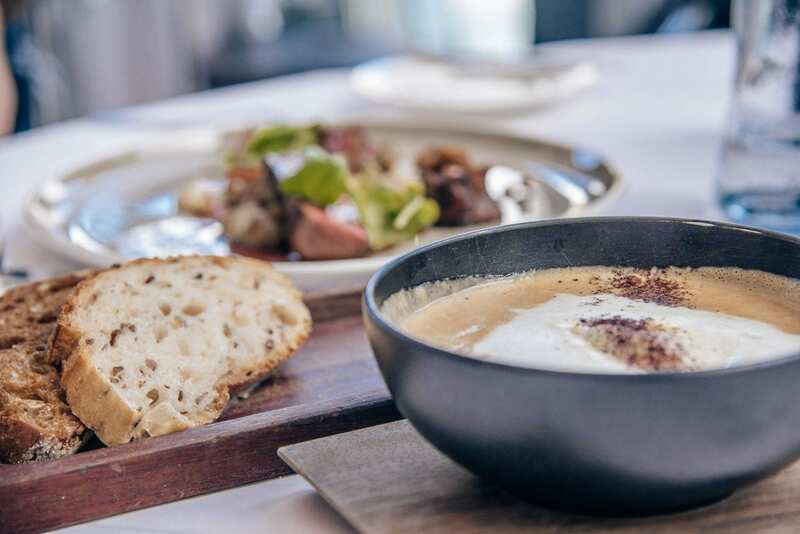 This restaurant does come with a price tag, but the food is so worth it! Harrison ordered a steak cooked medium, and it was literally medium all the way throughout- the sign of an expert chef! 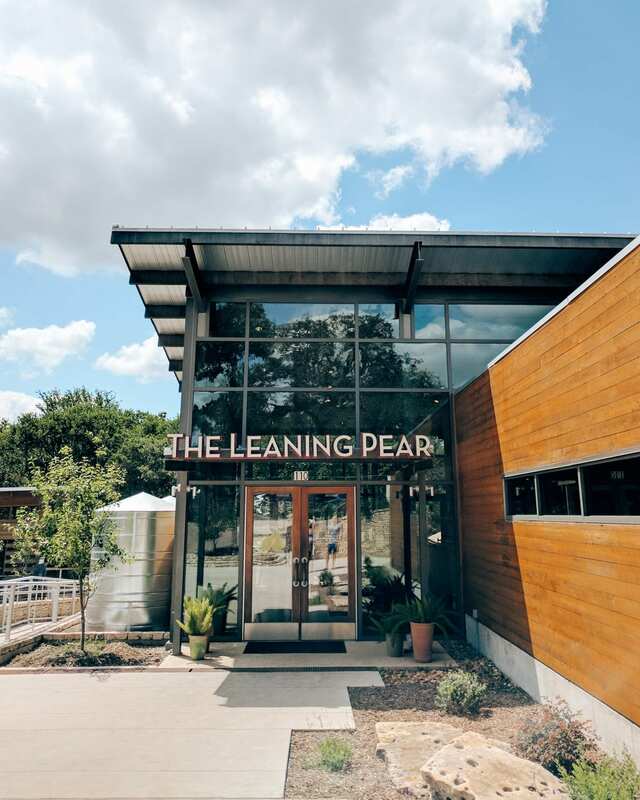 Wimberley’s Leaning Pear serves delicious food amidst beautiful decor in a lush setting. I recommend enjoying your meal out on their back patio- you’ll be completely surrounded by gorgeous, dense trees! 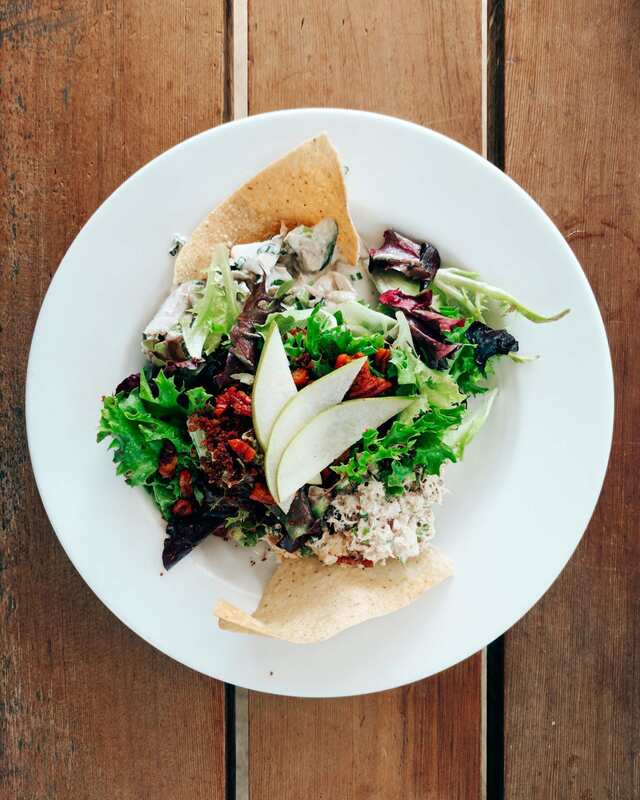 Their food is prepared using seasonal, fresh, and local ingredients, supporting the sustainable food movement. 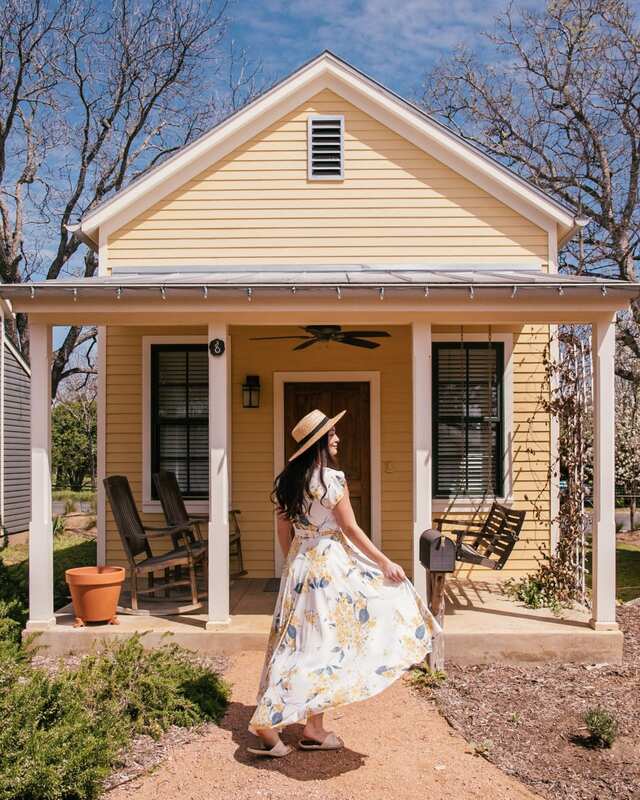 We loved staying at our little Wine Country Cottage in Fredericksburg that has history in its bones! Our cottage, the Loeffler-Weber cottage, was built in 1846! While the appearance is true to it’s original state, there are all of the conveniences of modern plumbing, central heat and air conditioning, etc. There’s also a hot tub out back for true relaxation! But my favorite touch was the mouthwatering raspberry danish that came with our room! 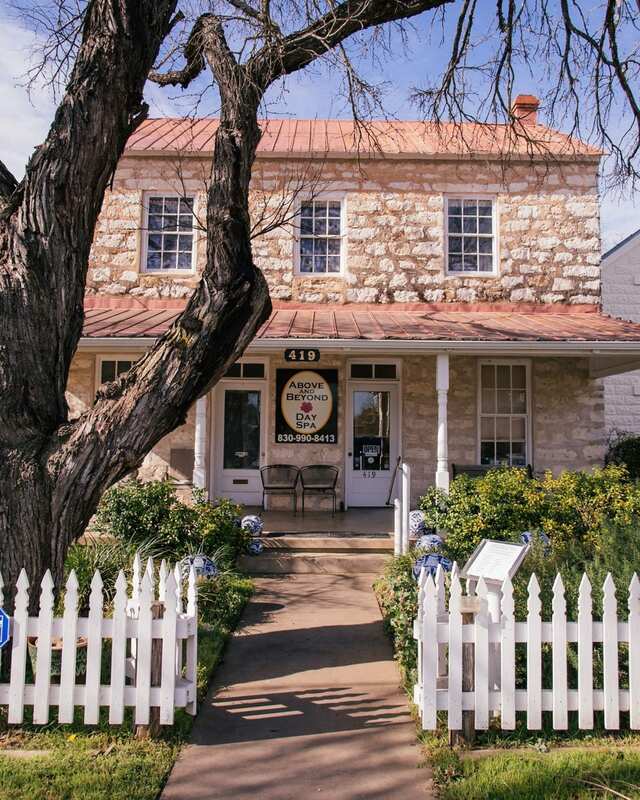 The Wine Country Cottages are right on Main Street, so they’re walking distance to all of the quaint shops in Fredericksburg! 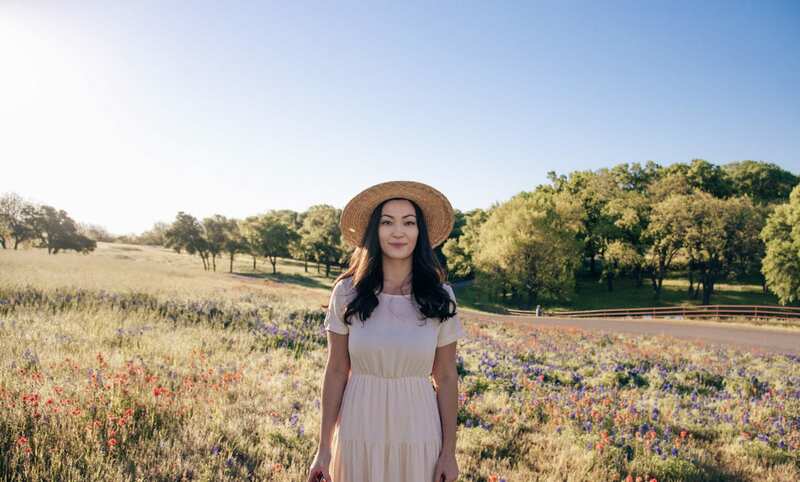 The Fredericksburg Herb Garden Sunday cottages are a modern take on a historical tradition. 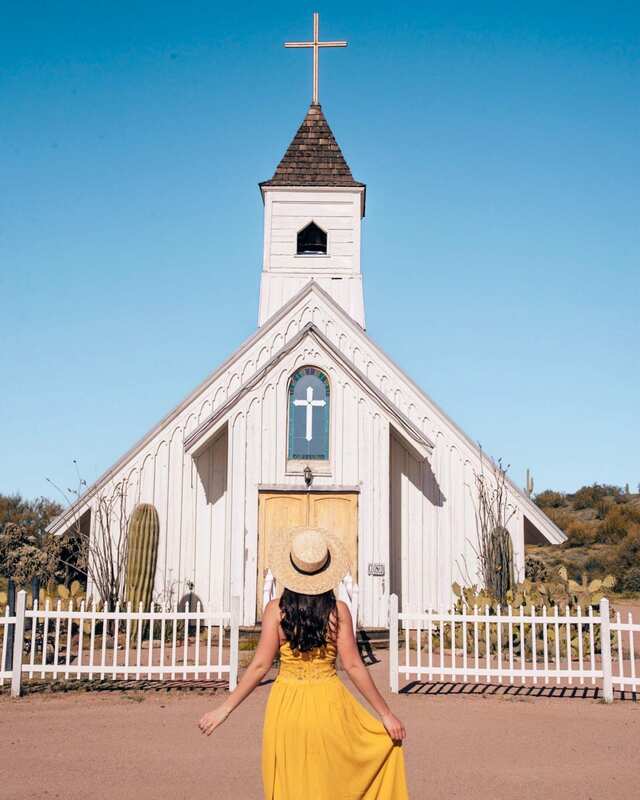 German settlers would come into town on the weekends to gather provisions and attend church on Sundays- which is where the quaint name comes from! 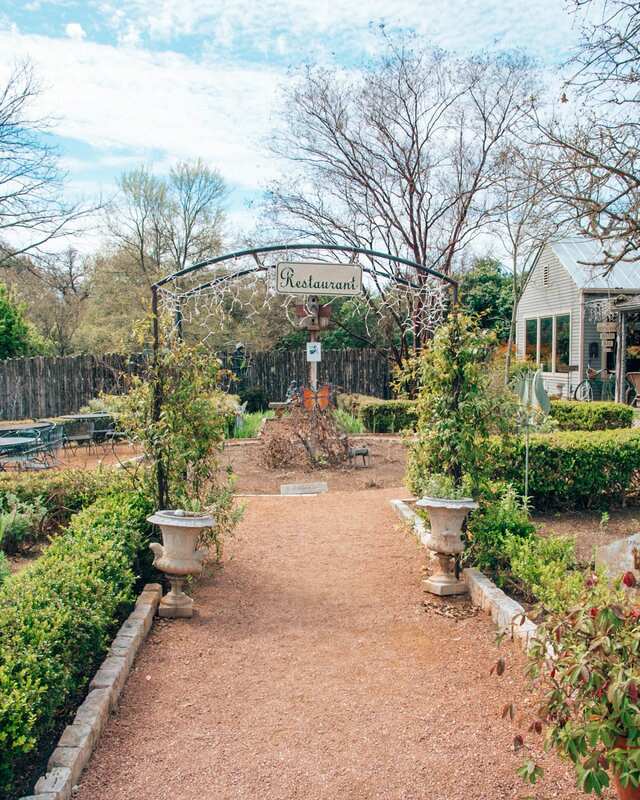 In addition to the Sunday cottages, Fredericksburg Herb Garden has a spa, gift shop, and restaurant. 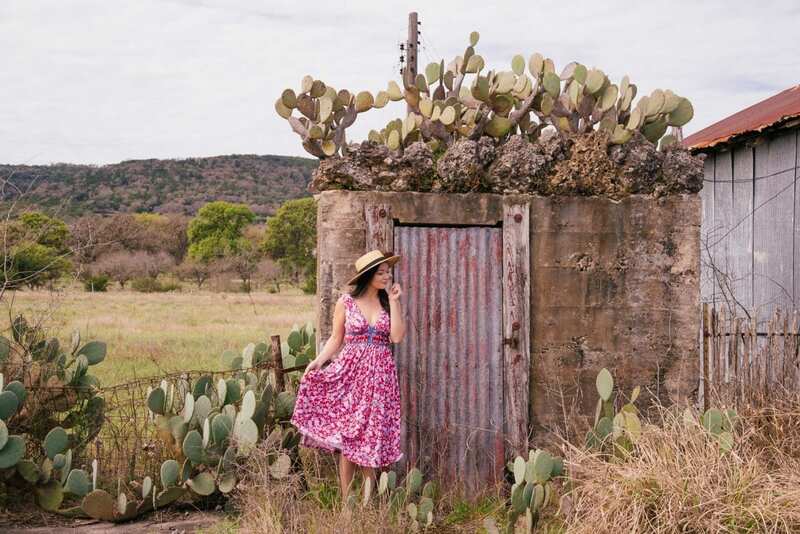 You’ve got to stop and enjoy this German-settled town if you’re in the Hill Country! 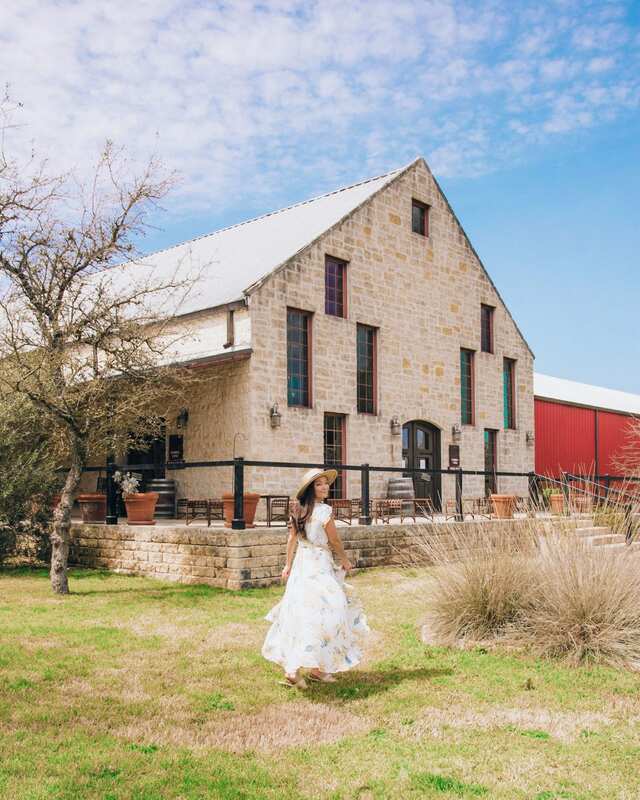 A walk up and down Main Street should definitely be on your Hill Country itinerary. Be sure to explore the antique shops, art galleries, and restaurants. If you’re in town on a Thursday, the Farmers Market is at the market square from 4-7PM from mid-April to the end of September! There’s plenty of history in this town, too. You can learn all about the early settlers and their way of life at the Pioneer Museum. 90 minute Swedish couples massage. Need I say more? Harrison and I felt absolutely spoiled by ours- it was one of the best we’d ever had! The masseuses at Above and Beyond Day Spa are absolute pros. Best of all, it’s right on Main Street, so it’s close to all of the other Main Street attractions! 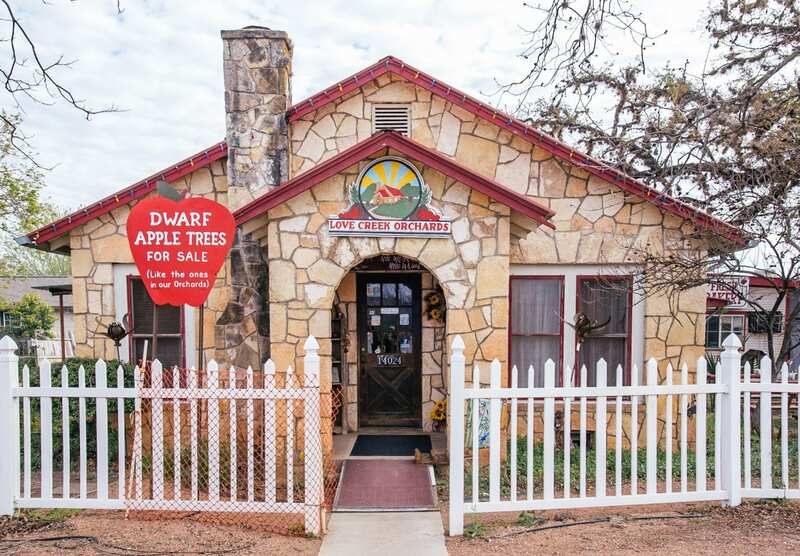 As you’re driving through the Hill country, you’ll pass so many cute towns with funky gems. 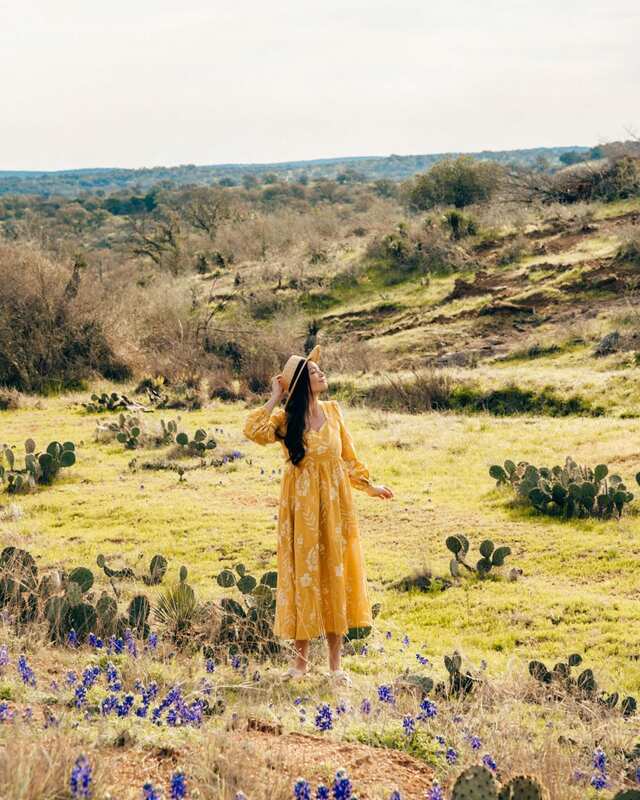 We captured this photo in Bandera, TX on our way from Medina to Utopia. 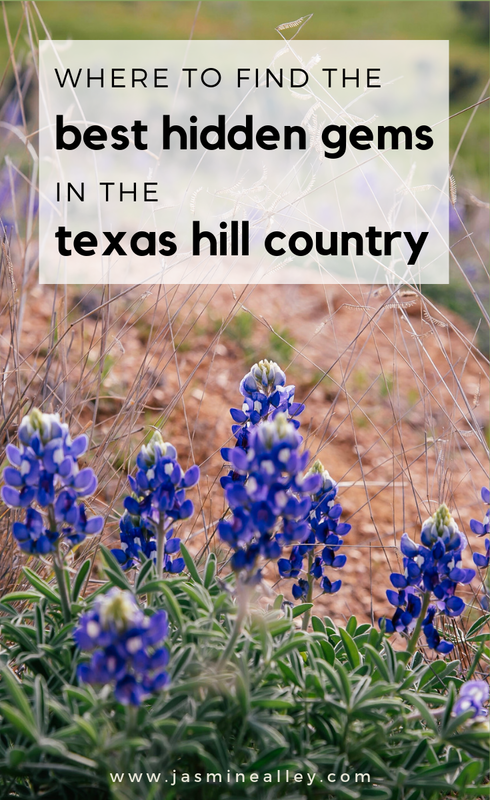 There is so much to see as you’re driving through the Texas Hill Country, passing from town to town. You can find a replica of Stonehenge (dubbed Stonehenge II) and Easter Island Heads in Ingram, TX. 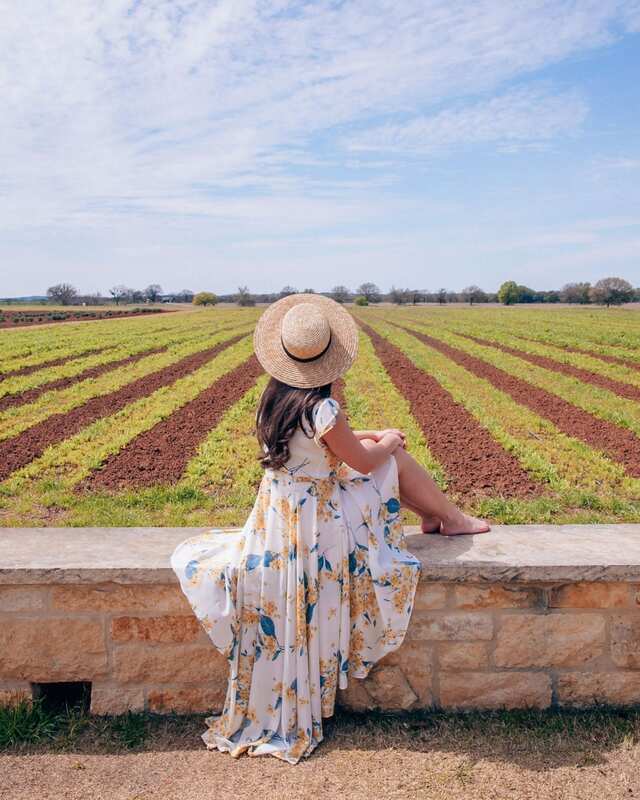 For lavender farms in the early summer, visit Llano, TX. You’ll find the best barbecue, Salt Lick BBQ, in Driftwood, TX. There are tree house rentals on the Frio River near Garner State Park. And so much more! 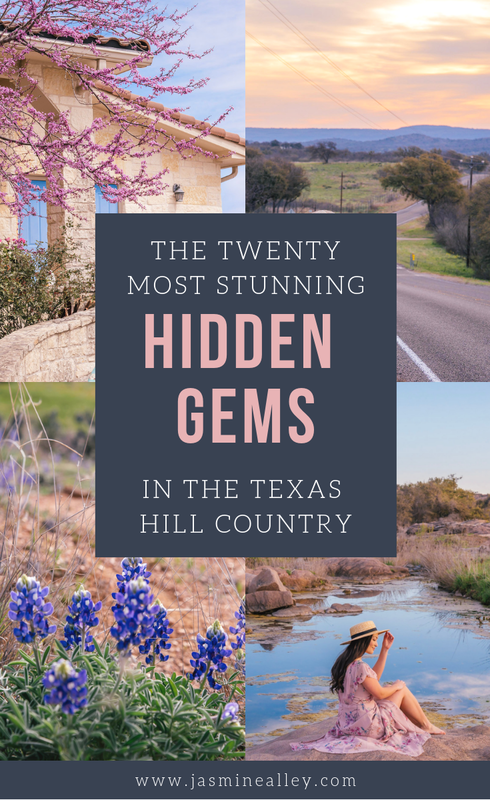 Next time, we’ll have to extend our trip beyond a weekend getaway to find more hidden gems in the Hill Country! A special thanks to Toyota for sponsoring our Texas Adventure to the Texas Hill Country!! This post wouldn’t exist without them! PS. If you found this post helpful, please share it to Pinterest! You can add it to your Texas Travel board (or any other board) so that you can go back to it later! Here’s an image for easy pinning! 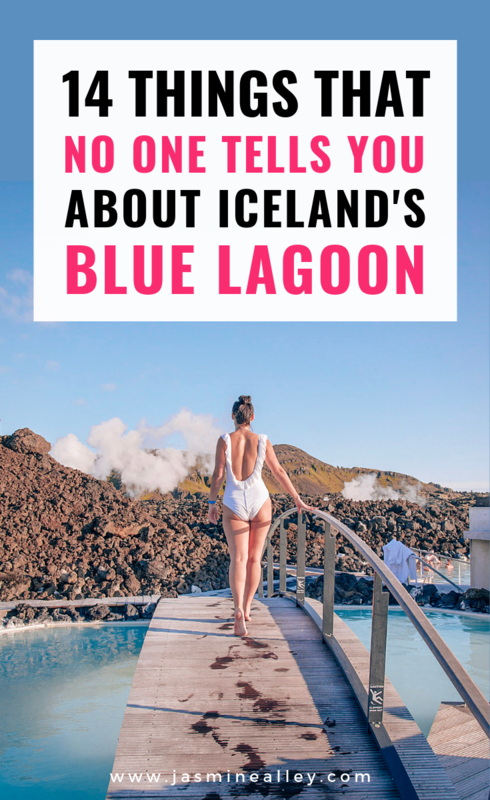 If you’ve stumbled upon this article, you probably are researching the Blue Lagoon in Iceland or interested in visiting someday. 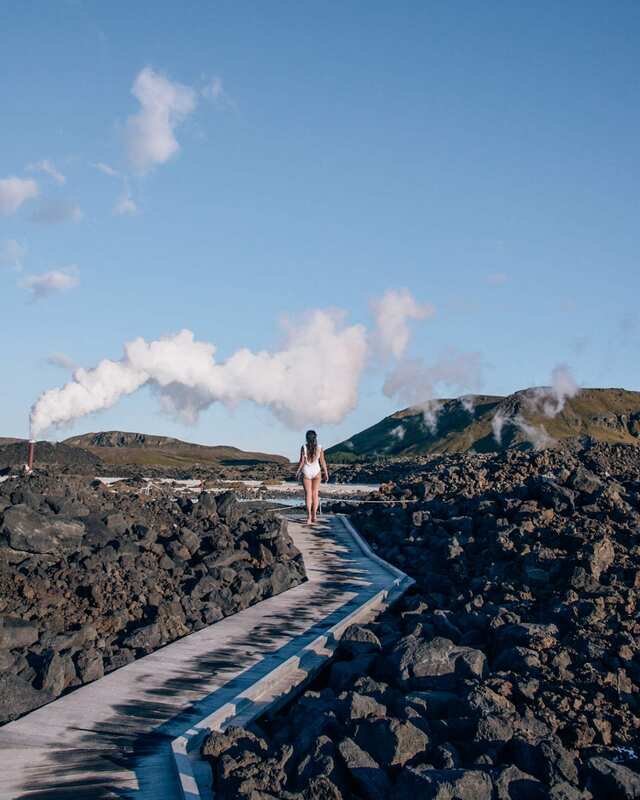 You probably know by know that there’s a ton of hype surrounding Iceland’s Blue Lagoon. I hope to paint a picture of exactly what you can expect at the Blue Lagoon, and share how to get the ultimate experience here. I’m also going to answer a bunch of questions that I had before visiting, that you might also have. These are questions that I had trouble finding the answer to online. After reading this post, you can decide for yourself! To me, it is 110% worth it! Quite simply, it’s the one destination in Iceland that you won’t want to miss, even as touristy as it is. 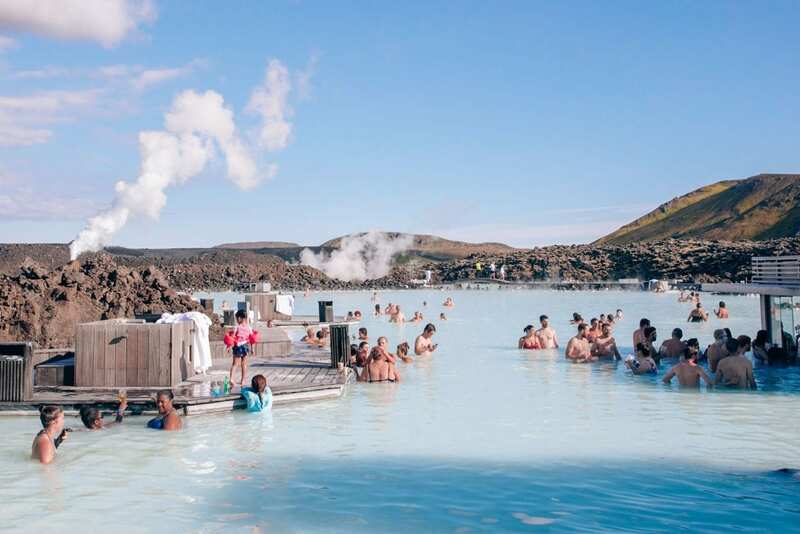 The Blue Lagoon is commonly mistaken to be a natural spa. The truth is, it’s entirely man made! It actually gets its intense blue and geothermic properties from the power plant next door! Finally in 1987 it was established as a swimming area and has since grown to be the luxurious retreat that it is today. A lot of people stop here on their Icelandic layover because it is so close to the airport (just 15 minutes away) and is a great way to de-stress from being on an airplane. It also is rumored to help with jet-lag since it leaves you so refreshed! 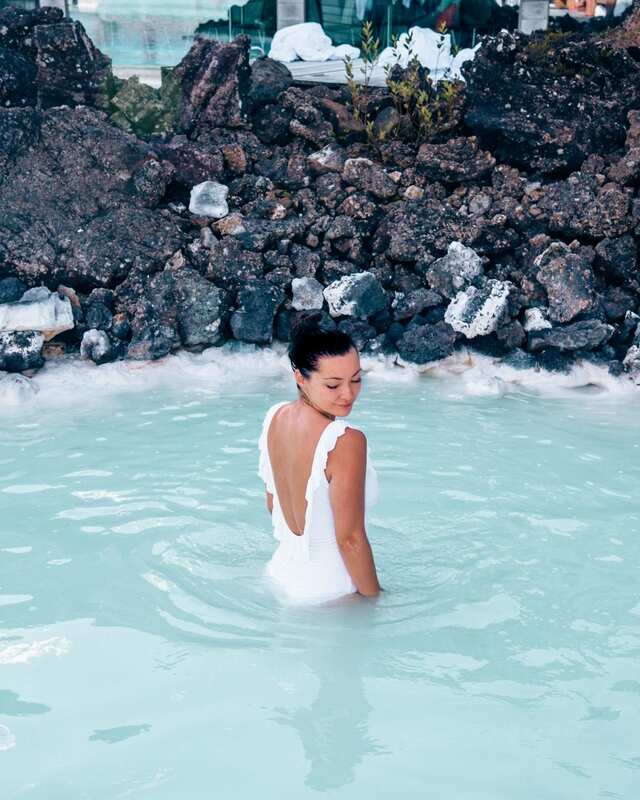 The geothermal waters are filled with silica and sulphur, and are known (and researched) for their healing and rejuvenating properties. 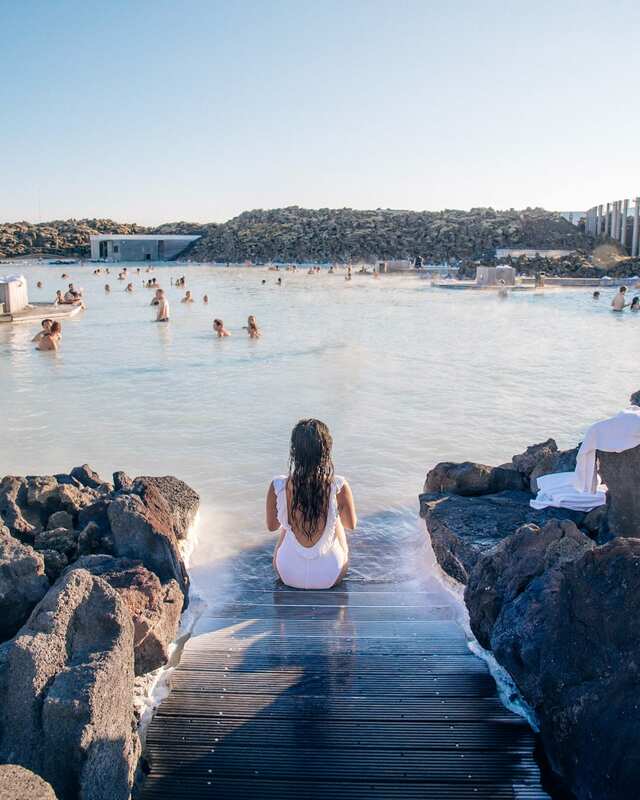 Surreal, otherworldly blue hues and a hot, relaxing swim in geothermal waters are the biggest draws to Iceland’s famous Blue Lagoon. 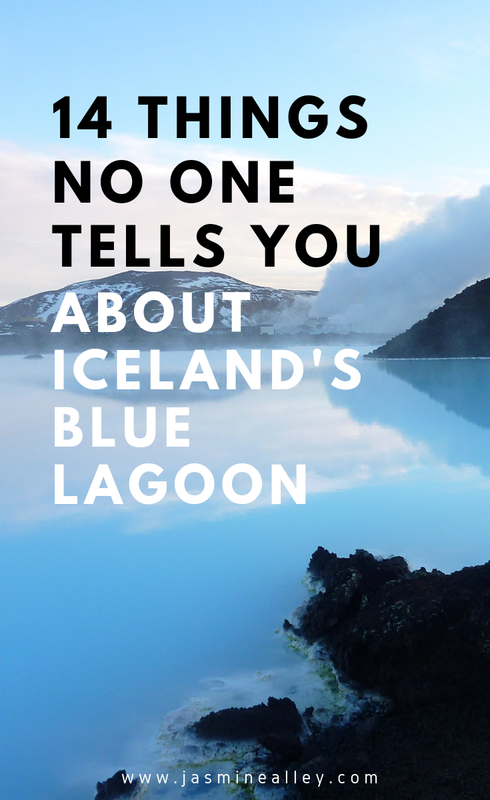 If you’ve done your research, you probably know that there will be plenty of people at the Blue Lagoon. You can expect an environment that encourages relaxation and enjoyment. Besides the perfectly hot waters, saunas and steam rooms are available to use. But there are a lot of details that you might have trouble finding online. Okay, maybe not NO one. But here are fourteen questions that I tried to research beforehand but didn’t find conclusive answers on. I’ve answered them for you, but if you have additional questions, comment them below! 1. Which Blue Lagoon package should I choose? Honestly, unless you have extra money to spend, there’s no need to get anything beyond the Comfort package. The Comfort package is the cheapest option. It comes with a silica mud mask, a towel, and a drink of your choice. When you upgrade your package to Premium, in addition to the Comfort features, you get an extra mud mask, a bathrobe to use, and slippers to wear. If you choose to dine at the restaurant you also get sparkling wine when dining. Their website adds “table reservation at Lava Restaurant” as an additional perk, but you can totally make a reservation if you opt for the Comfort package. So honestly I have no idea why that is listed as a Premium perk! The last package option is the Luxury option, featuring the Retreat Spa. 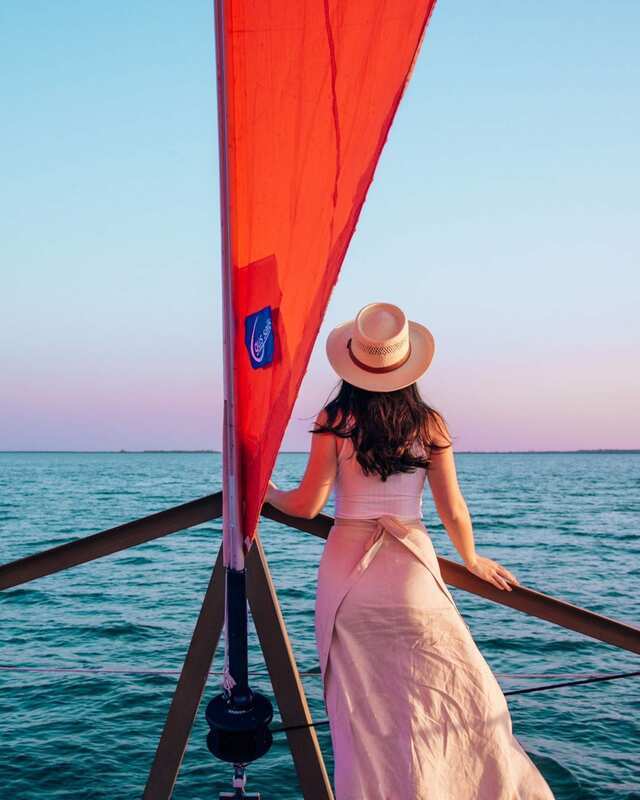 It offers things completely different than the Comfort and Premium options, so if you want the above and beyond the already full experience, then you can choose this package. It is about six times more expensive (depending on the day and season) so be prepared to shell out the big bucks. But you do get a lot more than the other two packages. The Luxury package offers access to the Retreat Lagoon (a private lagoon away from everyone else), gives you a private changing room, a massage and treatments, and is purchased in four hour chunks of time. Check out the package pricing on the Blue Lagoon’s website here. DRIVING THE RING ROAD? HERE ARE MY FAVORITE SPOTS AROUND ICELAND! 2. 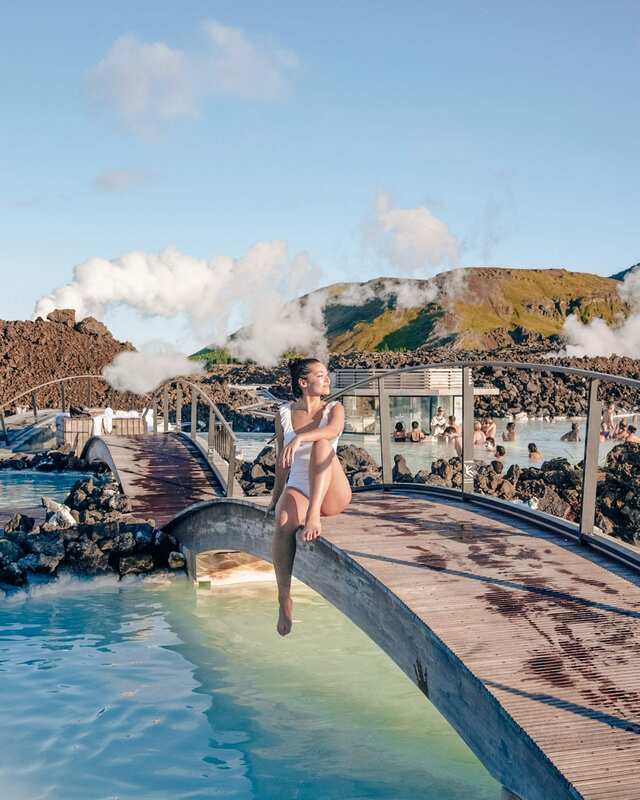 Do I need a special package to take the famous Instagram Blue Lagoon photo? This was a legitimate question that I had before visiting. Aggie from @travelinhershoes posted a photo at the Blue Lagoon, and I have since seen so many photos posted in the exact spot. It’s a beautiful photo so I totally understand why everyone is copying it. It’s the highest form of flattery after all, right? 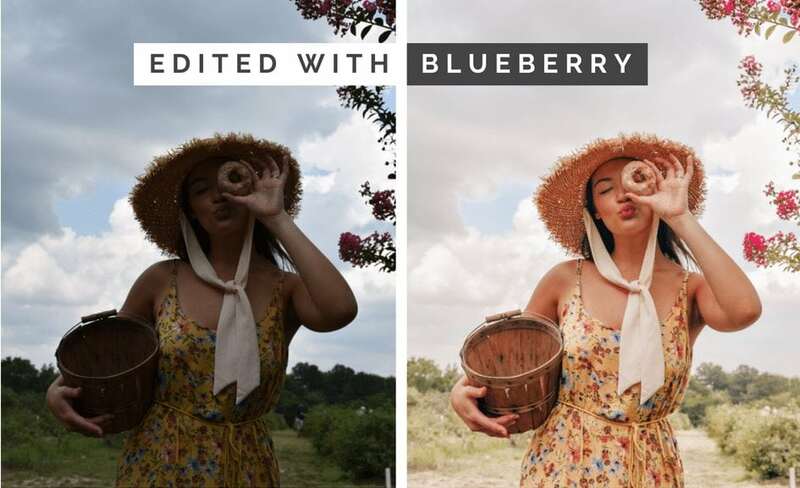 Since Aggie is a famous travel influencer, I figured that the Blue Lagoon had given her the Luxury package and that is how she took that shot without anyone in the area. But you can actually get that shot with the Basic Package. It is located right when you exit the dressing rooms, and sometimes just happens to be empty! So don’t splurge to get the famous shot. 3. Do people just chance it with their phones? We definitely saw some people holding their phones above water without any protection, but most had cases. We got these waterproof cases off of Amazon and they work really well under water. They stay completely water and air-tight. However, the minerals in the water sometimes make it hard for your phone to respond to your touch through the plastic, so you have to kind of wipe off your fingers every once in a while. 4. I shoot with a DSLR- what will that look like? My husband and I shoot with this DSLR and as soon as we were done with it I put it back in my locker (everyone gets a locker). You’ll want to have you or your photographer capture all of your shots before getting wet… otherwise you will be freezing cold. You’re not allowed in the lagoon area with clothes on, so you’re taking photos in freezing cold weather wearing your swimsuit and a towel or robe. That’s why it’s best to start out your time with the DSLR, capture all of your desired shots all at once, and then not bring it back out again. 5. What should I bring to the Blue Lagoon? All you need is yourself, your reservation email, a bathing suit, a hair tie, and flip flops (optional). I recommend bringing a waterproof phone case and your DSLR if you are a photographer/blogger. 6. What drink options come with the basic package? You can choose beer, wine, or- my favorite- a smoothie! We opted for the strawberry banana smoothies and they were SO delicious! 7. Is the robe necessary? Or will I freeze?! Without a robe you might freeze for a under a minute, from when you leave the changing rooms and when you enter the lagoon. So if you can tough it out, it is not necessary. You can also use your towel as a makeshift robe. 8. What about the slippers? Are they needed? We brought flip flops with us (these under $5 flip flops) and then just left them by the edge of the lagoon like many other people did. You don’t need to wear them in the lagoon, in fact wearing flip flops underwater makes it really hard to move, so I recommend going without them. Just be careful when you are entering the lagoon- the rocks can be really slippery! 9. Is the restaurant worth it? Yes, it’s worth it! You get cool views of the lagoon and delicious food. Price-wise, most of the food is comparable to the rest of Reykjavik, and it is absolutely delicious! Even the complementary bread and butter that they bring out is to die for! 10. Do I need to wash my hair and take off my makeup? Everyone looks flawless in their Instagram photos! I don’t know how people look flawless in their Instagram photos. Yes, you most definitely need to do both of these things. My guess is that they don’t follow the rules and wash their hair and take off their makeup, but I can’t be sure. There is no one walking around checking that you’ve done so, but I’m begging you to PLEASE take off your makeup and wash your hair like the instructions say. It’s for sanitary reasons and to keep the lagoon clean. You might want to rationalize and say that you just won’t put your face underwater, but you basically have to if you want the full experience. 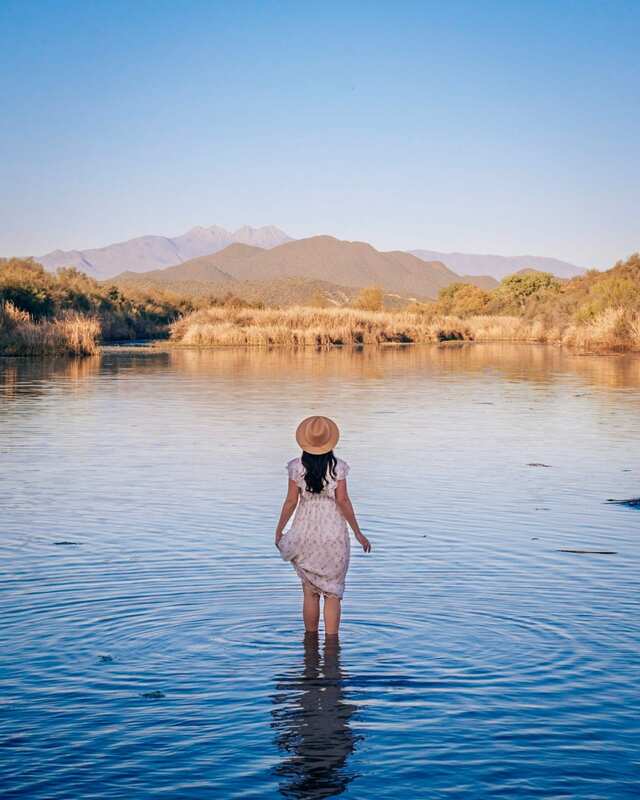 When you put the free silica mud mask on, you have to wash it off within a few minutes– can you imagine how gross it would be if your makeup was washed into the lagoon? 11. What happens if I put my hair underwater? And does the conditioner trick work? If you put your hair underwater, it’ll be really coarse and tangled for the next several days. I had read that soaking your hair in the provided conditioner helps prevent the weird texture change, but my hair still felt really weird for the next two days. But I bet that without the conditioner, my hair would’ve been weirder for longer, so I wouldn’t risk not doing the conditioner trick. And of course, you can just keep your hair in a bun out of the water if you want, but there’s a chance it could get splashed and you won’t be able to go under the mini waterfall at the lagoon. 12. Do I have to get totally naked in front of strangers? There are a few changing rooms that are enclosed, so that’s not a problem. You might have to wait for the shower that has a curtain, but it’s doable. 13. When should I visit? Do I need a reservation? Anytime you get the chance. Obviously it will be less crowded on weekdays and the earlier you go, but you don’t control your flight. You most certainly need a reservation! I recommend booking as soon as you know you can go, and at least two weeks in advance. A couple of months would be ideal if you can plan that far in advance. You don’t want to risk it being sold out! Book it here! 14. Help! My flight is on a weekend- will the Blue Lagoon be too crowded to enjoy? Nope! I visited on a Saturday around 3pm in August (basically the “worst” time to go), and it wasn’t too bad! Because you have to make a reservation beforehand, there are limited spaces and the Blue Lagoon does a good job of making sure you’re not a sardine in a can. Even with many people at the lagoon, it is a completely fun and relaxing environment and you can find spots in the lagoon away from other people. The Blue Lagoon is a romantic, relaxing, otherworldly wonderland and you should definitely visit if you can! PS. If you found this post helpful, please share it to Pinterest! It would help me out a ton and that way you can save it for later! You can use the image below for easy pinning! At the end of January, Harrison and I got to go skiing in Ruidoso, New Mexico. Ruidoso is a gorgeous ski town set in the Sierra Blanca mountain range. As a Maryland native, I grew up skiing in Pennsylvania, and that is pretty much all I’ve known of skiing. My family would drive up to one of the ski resorts near Maryland where we’d rent our gear and hit the slopes. But never had I gone skiing on mountains as high as the ones at Ski Apache. Ski Apache sits just underneath the Sierra Blanca where the highest peak is 12,000 ft high! In fact, having never been to New Mexico, I didn’t know what to expect at all. But what I found in Ruidoso blew me away! 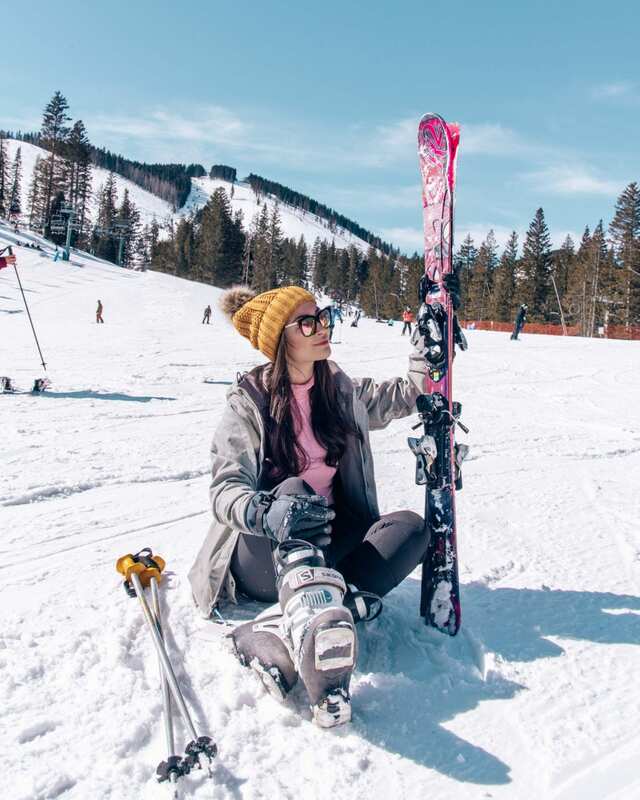 Ski Apache, the ski resort in Ruidoso, is set in the Sacramento Mountain Range of the Lincoln National Forest and offers runs for all skill levels. The main gondola brings you up over 11,000 ft high. It’s the only gondola of its kind in New Mexico! People ski down from this high up, but Harrison and I just went for the views. 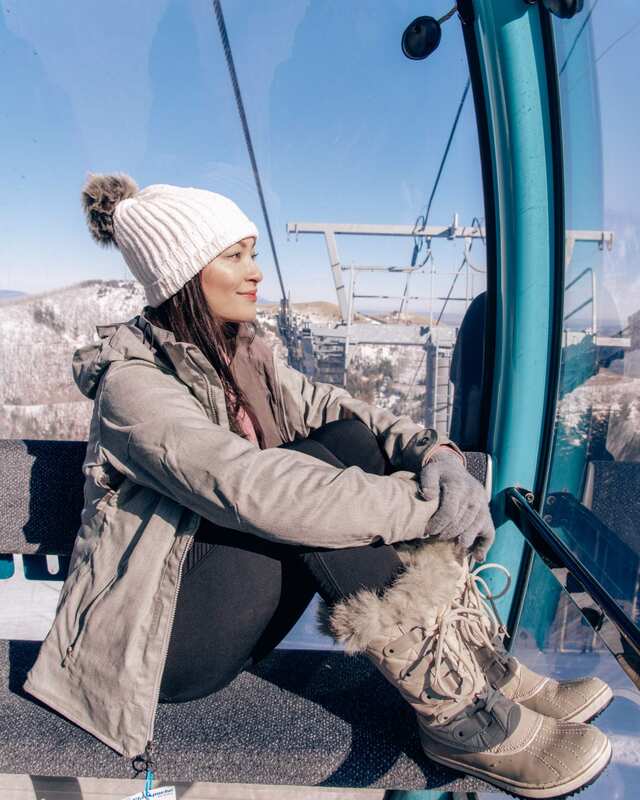 The gondola ride offers panoramic scenic views, and once you reach the top, you can see for miles! You can book your gondola ride ahead of time here, it costs $25 per adult. Alternatively, you can book it once you arrive at Ski Apache. The gondola is great for all ages; little ones are definitely welcome to come up to the top! Kids under the age of 5 actually ride free! There are places for your skis and snowboards right next to the door of the gondola if you want to bring them with you and ski/snowboard down from the top. Up to eight people fit in a gondola, and it takes about 15 minutes to ride up to the top (I didn’t time our ride, but it felt right around that long!). Another great thing about Ski Apache is their phenomenal ski school. I may be sitting down in this photo, but it was by choice. Believe it or not, Harrison and I didn’t fall down a single time the entire day. And Harrison had never skied before- ever. Our wonderful instructor, Ken, taught us the basics first, then stayed with us until we got the hang of it. You actually start learning without skis on at all so that you can learn the technique you’re supposed to employ with your feet. Then you put one ski on, learn a bit, and then the other. So don’t worry if you’re a beginner skier – Ski Apache will welcome you! After your lesson, you’ll be ready to hit the slopes! Ski Apache has 11 lifts and 55 different trails (though not all are open all of the time.) With so many trails, you can expect a great mix of difficulty levels. If you’re a beginner like Harrison and me, you can stick to the greens. If you’re more advanced or an expert (like Ken who does extreme skiing! ), you can tackle the many advanced trails at Ski Apache. You can see all of their slopes on this trail map. 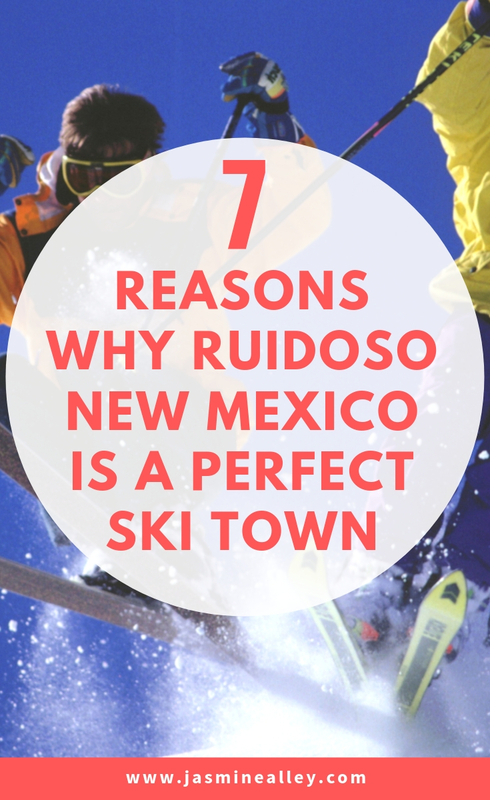 Yet another reason why Ruidoso is a perfect ski destination is its climate. Did you know that Ski Apache is the country’s southernmost continuously operating ski resort? With that, you get great weather perks! The town of Ruidoso isn’t too cold because you’re not too far north. But at the same time, it sits at a 7,000 foot elevation, which lends to its great proximity to the ski area. You’ll find great ski weather at Ski Apache since you’re actually in the mountains at 9,600 feet with about fifteen feet of annual snowfall. So, you can get the best of both worlds – you can easily hike and bike in the village below in a temperate climate while also catching a day on the slopes, all in the same trip. One thing to keep in mind is that the snow reflects UV rays, and New Mexico is known for its brilliantly blue sunny skies. So be sure to bring sunscreen with you when you hit the slopes! We forgot that important detail and it showed on Harrison’s face for the next week! 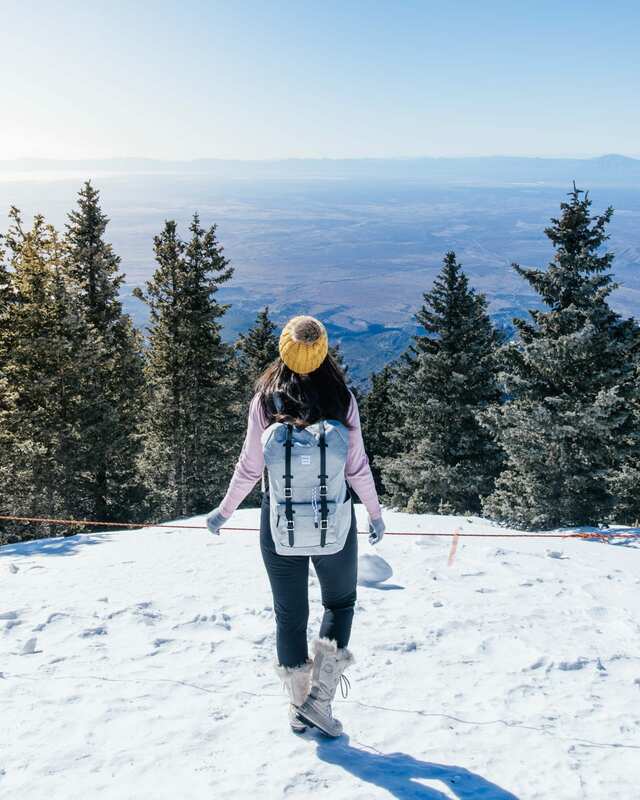 Besides the great heights, trails, and lessons at Ski Apache, you’ll also find great charm in the town of Ruidoso. As cheesy as that may sound, it’s true. On our recent trip, we got to know some of the locals. Ken, our Ski School instructor was so kind in teaching us. Stan, who owns the A-Frame Ski Shop and the Escape Resort, made sure we had everything we could possibly need. There were so many people we got to talk to, and the conclusion we came to is that this town is full of kind people. 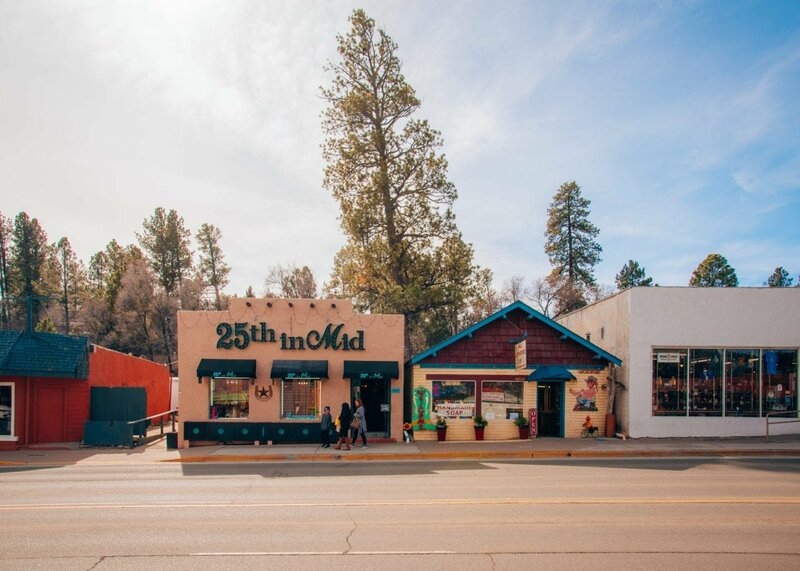 That’s just part of Ruidoso’s small town charm. And when I say small town, I mean small: it had a population of roughly 8,000 people in 2018. With that small town charm, you’ll find great local stores and family owned businesses. My favorite local business that we visited was the Old Barrel Tea Company, which started in Ruidoso and has since grown to include other locations throughout New Mexico and Colorado. The Old Barrel Tea Co is family-owned and female run. 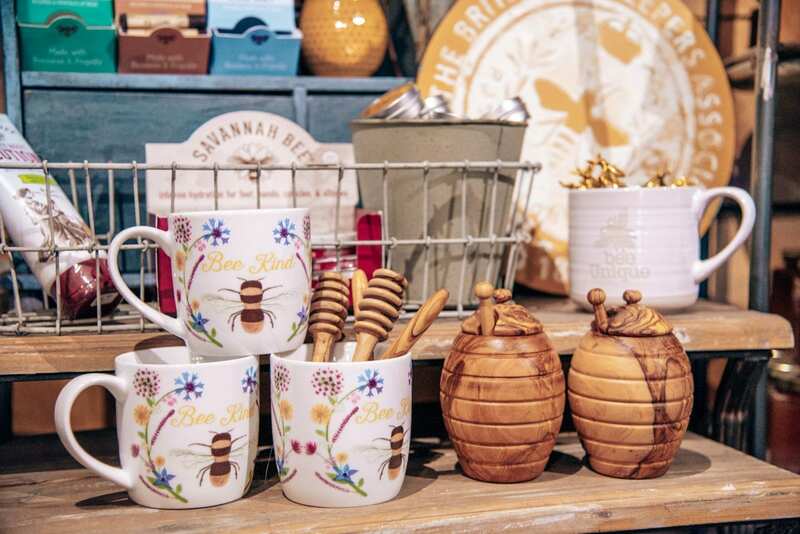 If you’re in the area you simply must stop in to sample their teas and honey. Their Chocolate Orange Pu Erh tea is my favorite! But be warned, once you sample their tea, you’ll most likely walk out with more tea than you need – it’s just that good! And despite being a small town, Ruidoso boasts a fully equipped theater. The Spencer Theater features world-class performances, including shows that are off Broadway. A lot of shows actually use the Spencer Theater to finesse their tech details, which means you can catch a popular show at a great price. It also is a masterpiece within itself – you can see plenty of Chihuly glass art installments throughout the theater. 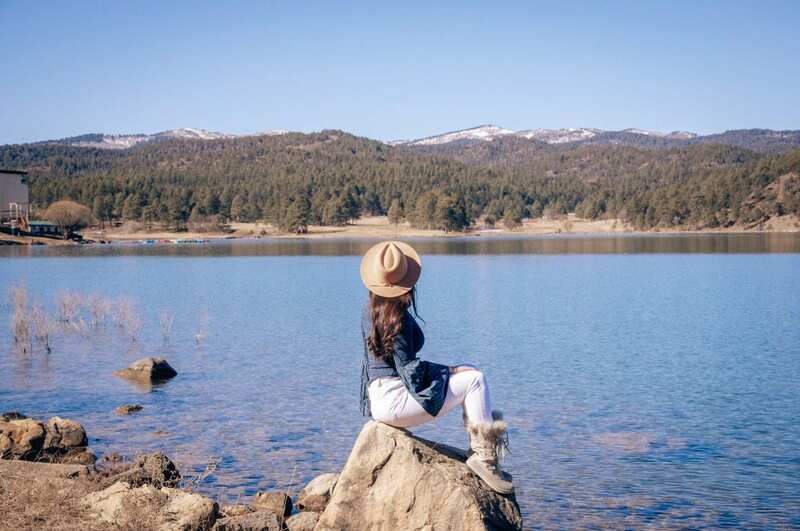 There are so many things to do in the town of Ruidoso. From beautiful lakes like this one to a much-needed massage after skiing, you’ll find it all here. Want to go to a casino? The nearby Inn of the Mountain Gods is there for you! Want to catch a performance? Like I mentioned earlier, you can check out the Spencer Theater. Want some fresh pizza? Cafe Rio is calling your name! 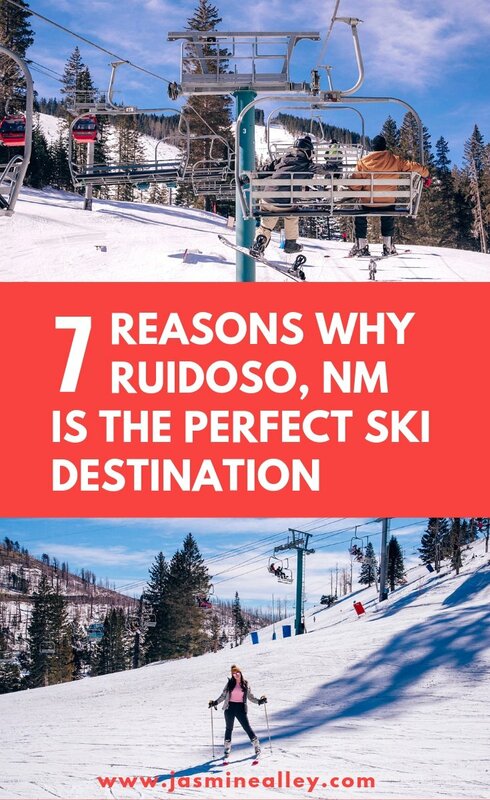 See this post on 12 things to do besides skiing in Ruidoso! If you fly into Albuquerque and drive to Ruidoso, you’ll find this gorgeous nature sanctuary on the way. Bosque del Apache is about 1 hour and 20 minutes from Ruidoso. Over 300 bird species call this nature preserve home, and it’s no wonder why! Bosque del Apache is a wildlife refuge with over 7,000 acres of flood plains for the birds to call home. It was established in the 1930’s after the Civilian Conservation Corps realized the extent of the damage that modernization had done to the habitat and its wildlife. Now when you visit, you get to see the natural beauty teeming with life. According to their website, you can see the most birds between early November to late January, though every season has plenty to offer! In the winter months, it is commonplace to see cranes, waterfowl and snow geese, as well as the occasional bald eagle. There were 8 bald eagles spotted on the day we went! When you arrive, stop at the visitor’s center to inquire about recent bird sightings, that way you know exactly what to look for! The volunteers and staff at the center are incredibly helpful and kind. We got the feel that they really wanted us to make the most of our time there! As you drive the main loop through the nature preserve, you’ll pass by so many birds and get to see mountains and ponds almost anywhere you go. We went around 10am, but I’ve been told that if you go in the early morning hours, you can capture stunning photographs of the birds taking flight! Just note that it’s $5 cash to get in- no credit cards accepted! Additionally, there are hiking trails throughout the preserve if you’d like to explore the terrain. 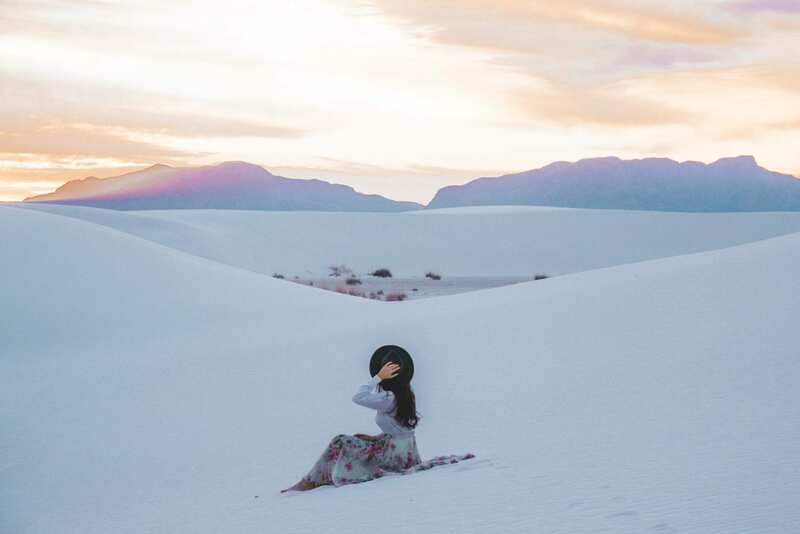 White Sands National Monument is only an hour and fifteen minutes away from Ruidoso. Nowhere else can you ski and ride down sand dunes on the same trip! And you won’t want to miss this remarkable National Monument. Fun fact: The dunes are classified as a National Monument because they are made up of rare white gypsum sand. It’s the largest dune field of it’s kind in the whole world! Picture this: over 200 square miles of stunning white sand, a landscape like nothing else. There is plenty to do at the sand dunes! You can see the unique wildlife, sled down the dunes, take pictures, enjoy a picnic, and even camp overnight! 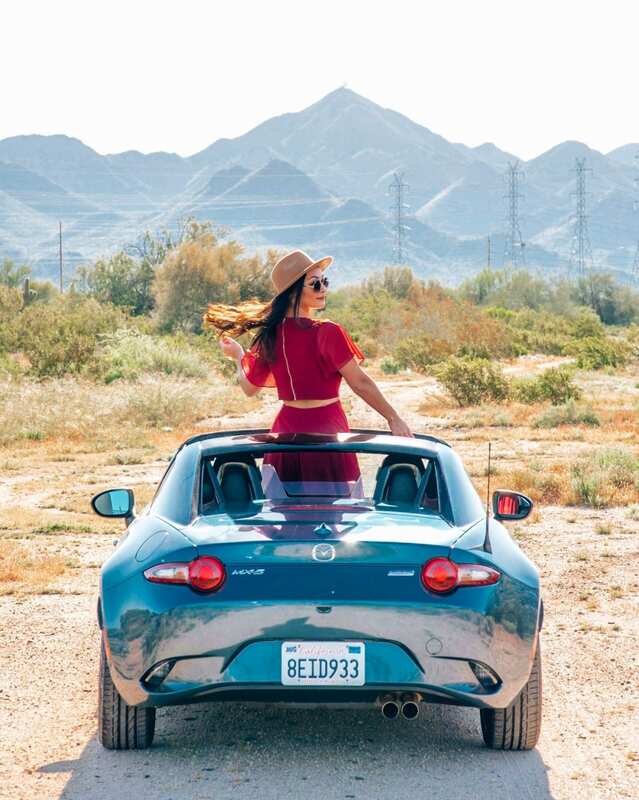 It costs $20 per car to enter White Sands National Monument. There is a main loop that navigates through the dunes. The road starts off paved but turns into a sand-covered road about four miles in. Don’t worry, you can still drive on the road! If you’re skiing in Ruidoso, chances are the weather will be a lot warmer by the sand dunes. When we went at the end of January, it was in the mid-50’s. With the sun out, it can seem even warmer than that. We visited on a mostly cloudy day around 4:30pm and the sand was cold on my bare feet- I insisted on going barefoot, you don’t have to- but overall the weather was mild. Definitely check out the dunes at sunset if you can! The sky is brilliant at these hours! But note that the dunes close at specific hours depending on the time of year. You can see the full hours here. And if you don’t have a sled of your own to bring, you can purchase one at the monument gift shop! 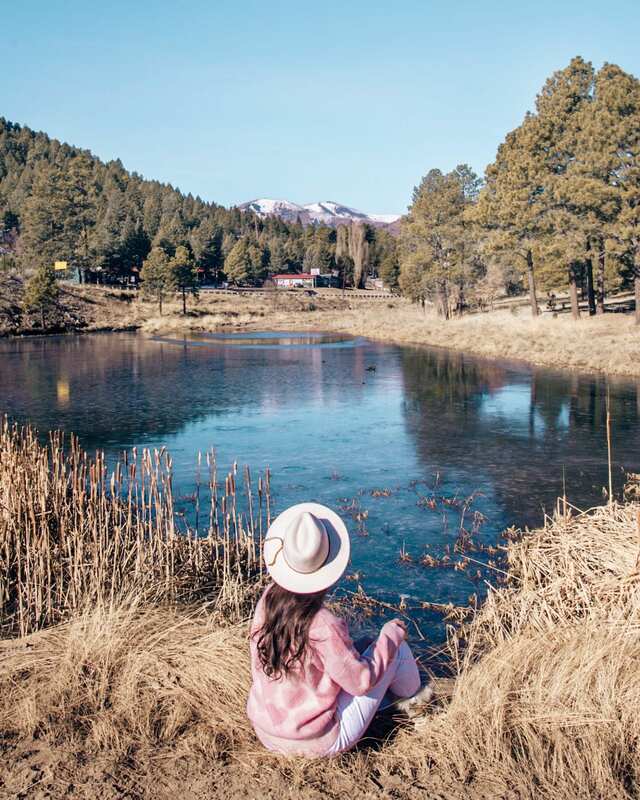 Simply put, Ruidoso is a small town with deep roots and natural beauty, filled with and surrounded by fun things to do. Its history is intertwined with that of the Mescalero Apache Native American tribe, whose lands border Ruidoso. Ruidoso had always been a ski town: even before Ski Apache existed, in the 1930’s the town had its own little ski slope with a gasoline-powered tow rope (source). But in the 1960’s, the Mescalero Apache tribe purchased what is now Ski Apache, bringing the skiing tradition to what it is today. Come visit it for yourself – this town has so much to offer as a ski destination! 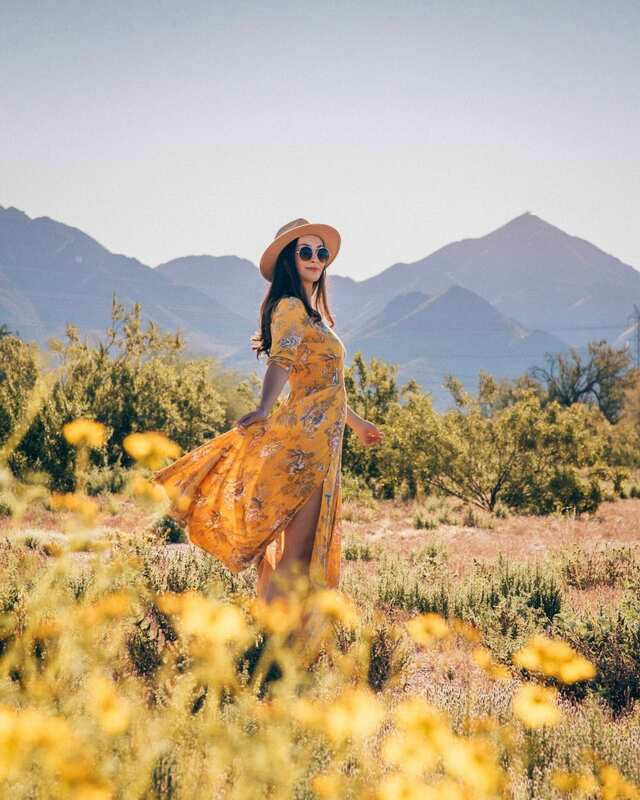 If you’ve been to Ruidoso and have things to add to my list, add them in the comments below! P.S. If you found this post helpful, please share it to Pinterest! You can use the image below for easy pinning!